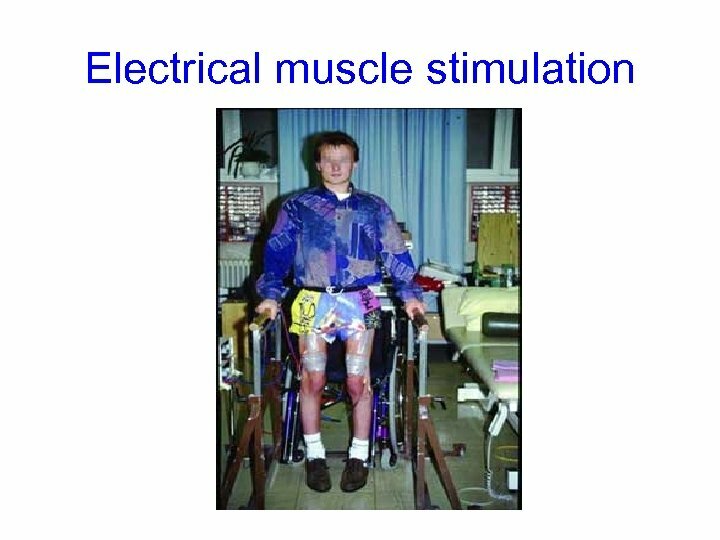 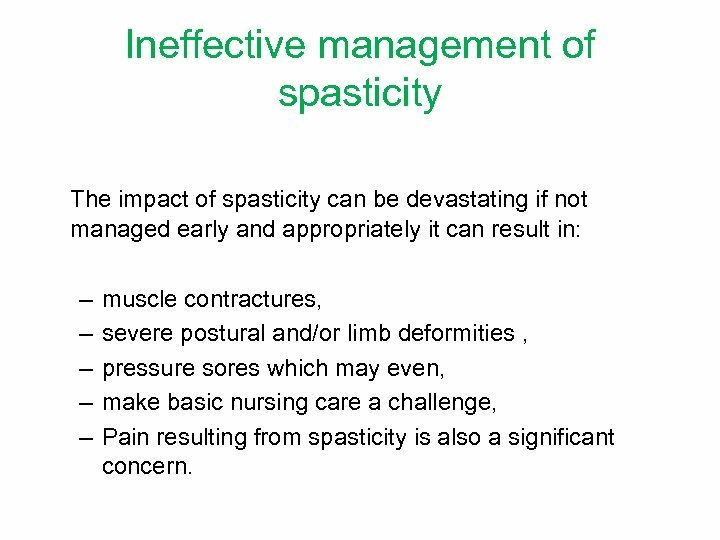 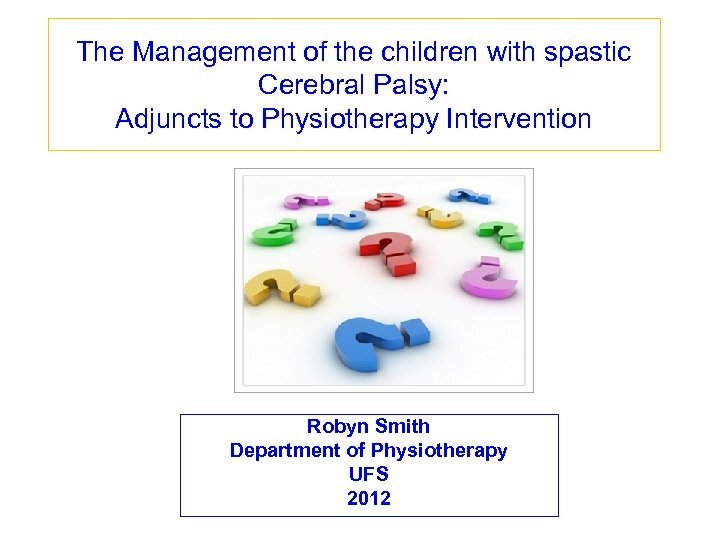 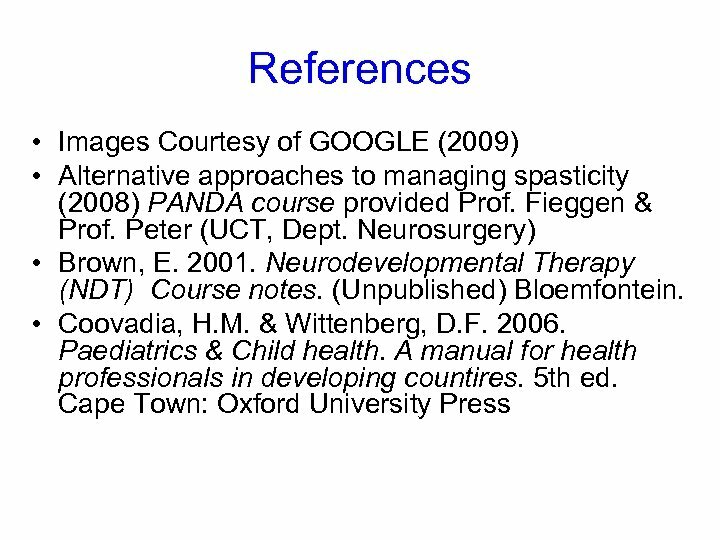 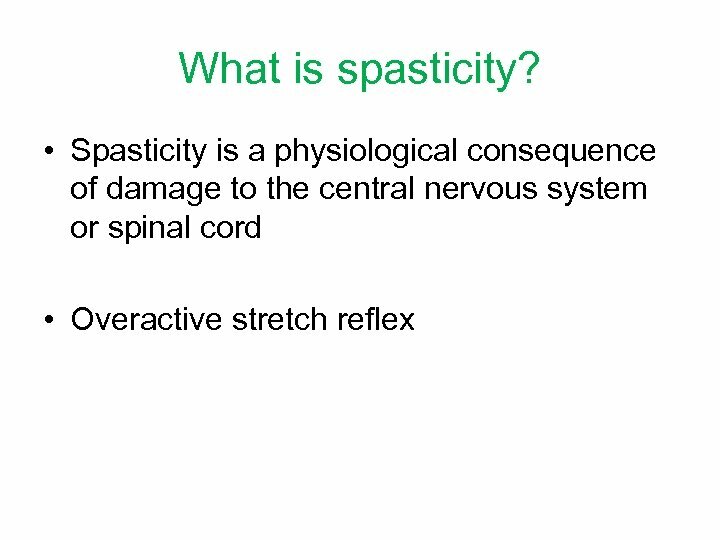 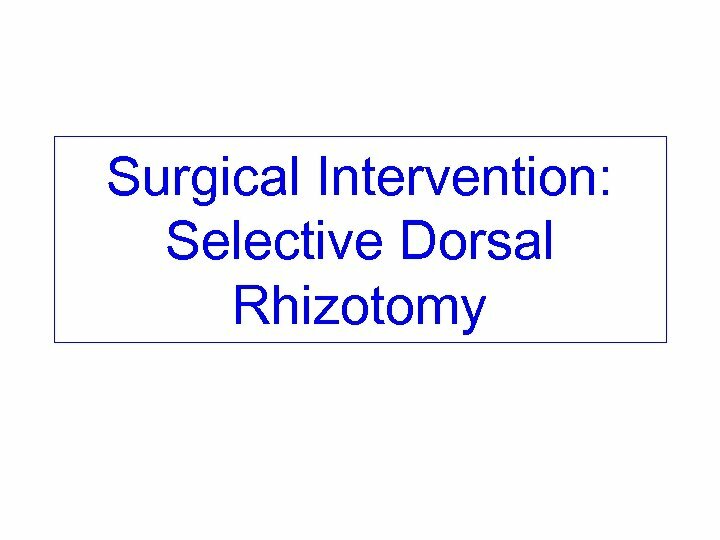 Ineffective management of spasticity The impact of spasticity can be devastating if not managed early and appropriately it can result in: – – – muscle contractures, severe postural and/or limb deformities , pressure sores which may even, make basic nursing care a challenge, Pain resulting from spasticity is also a significant concern. 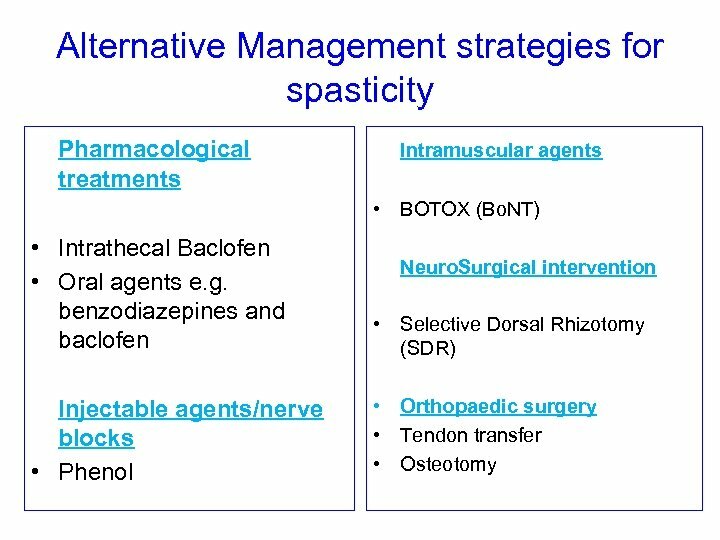 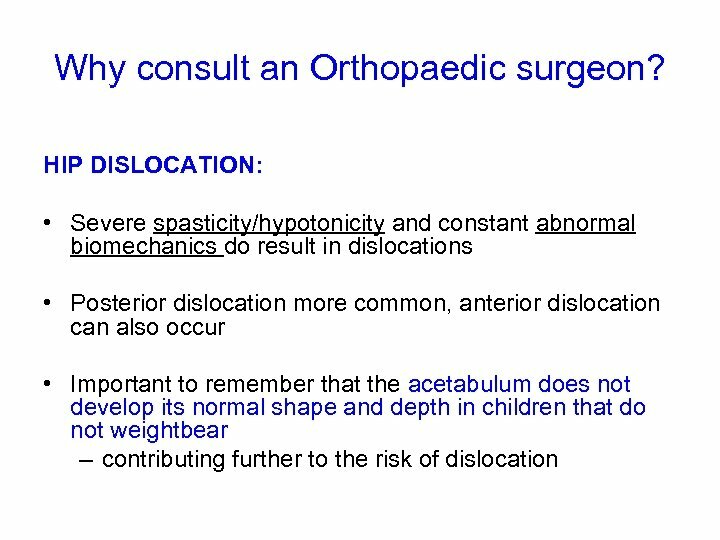 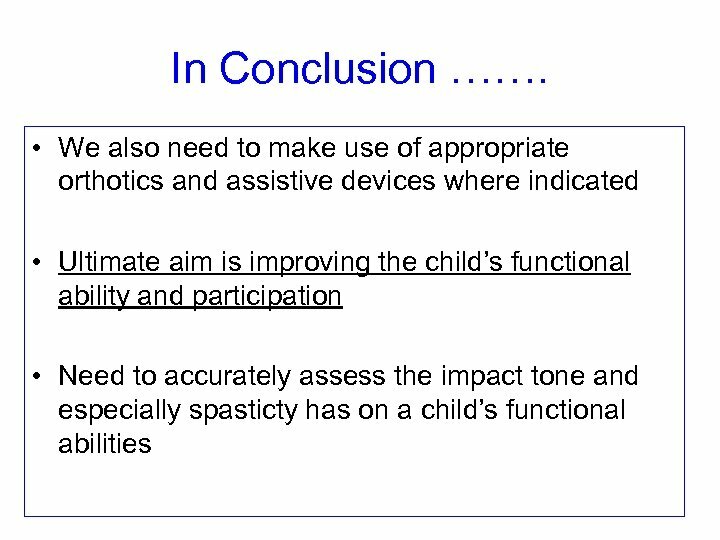 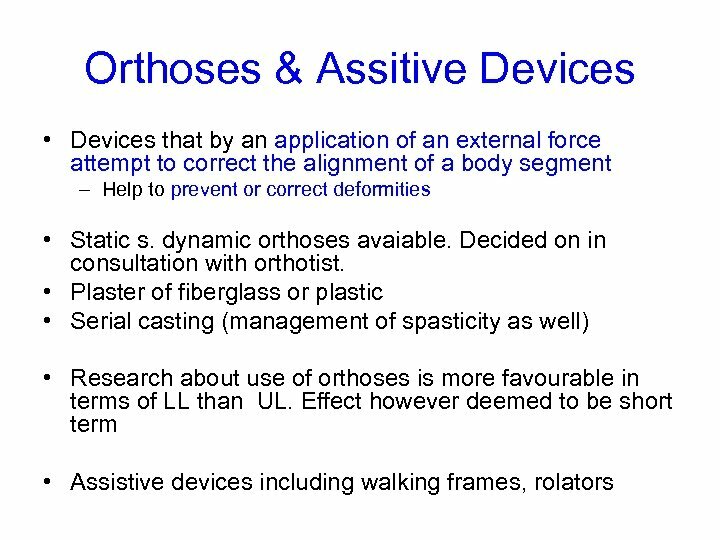 The effective management of spasticity is fundamental in the successful management of neurological disabilities and the prevention of secondary complications. 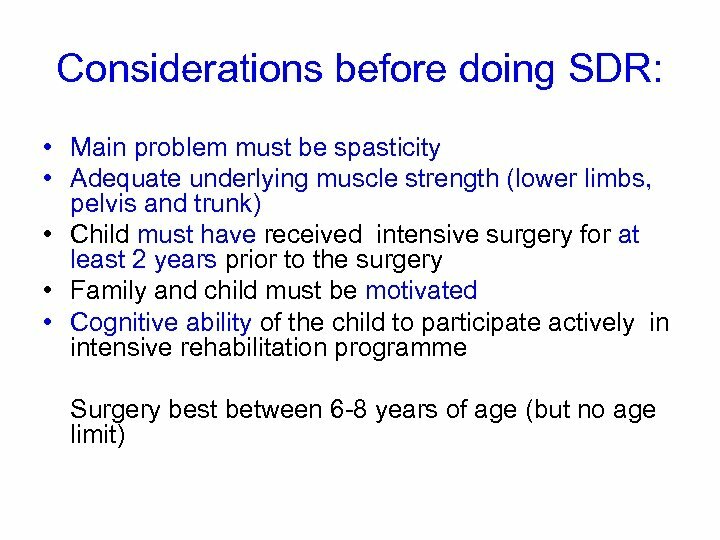 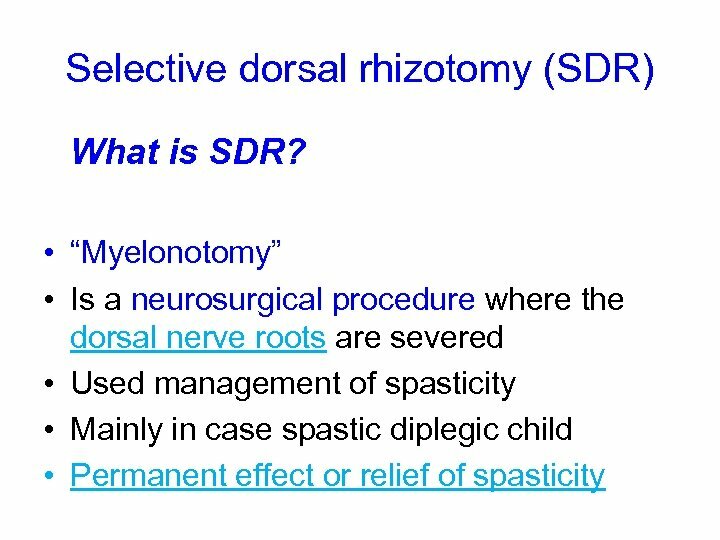 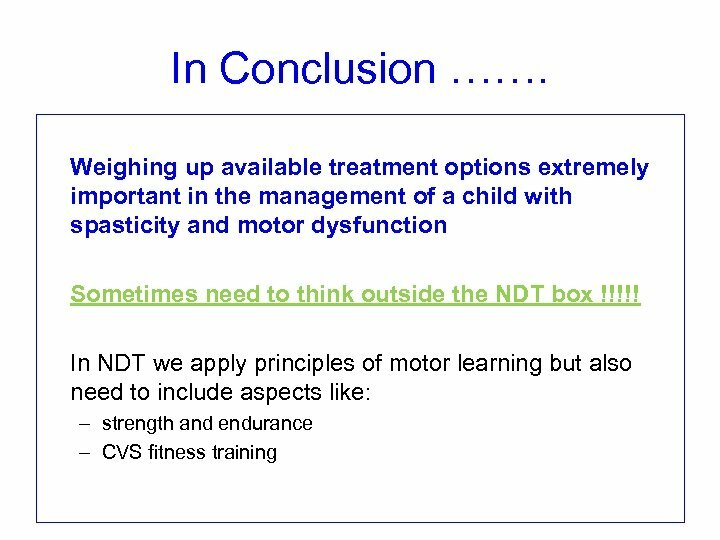 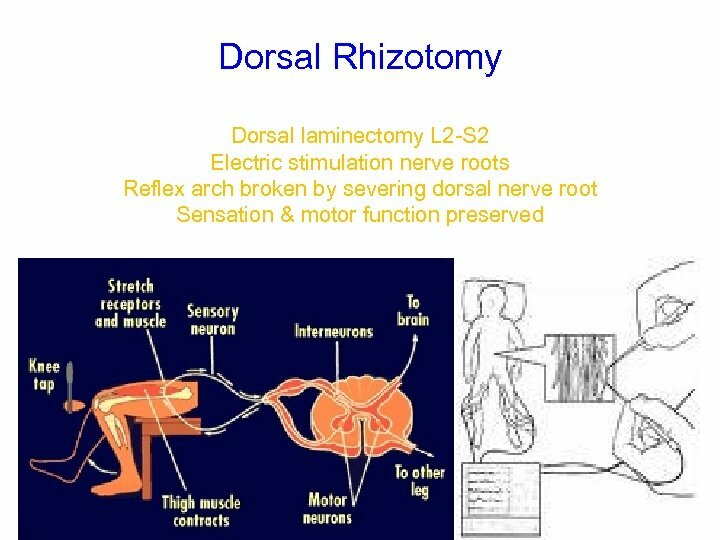 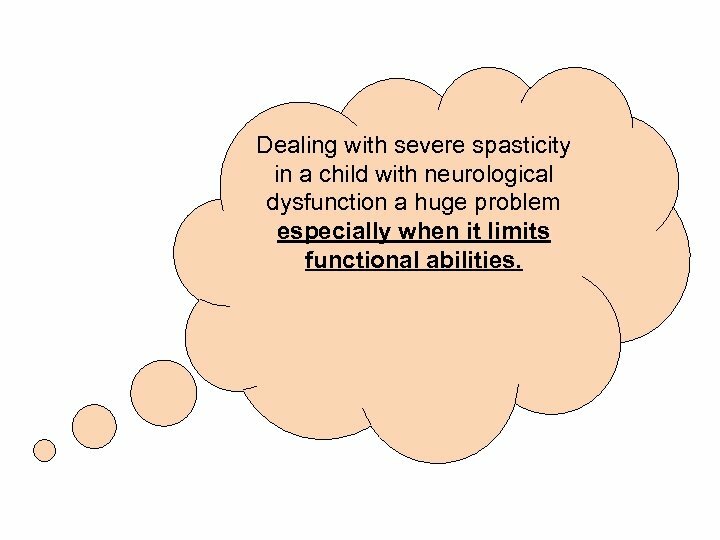 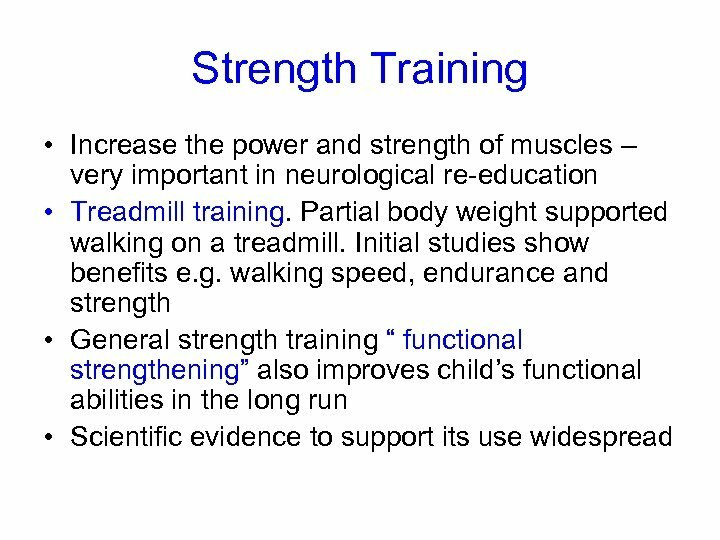 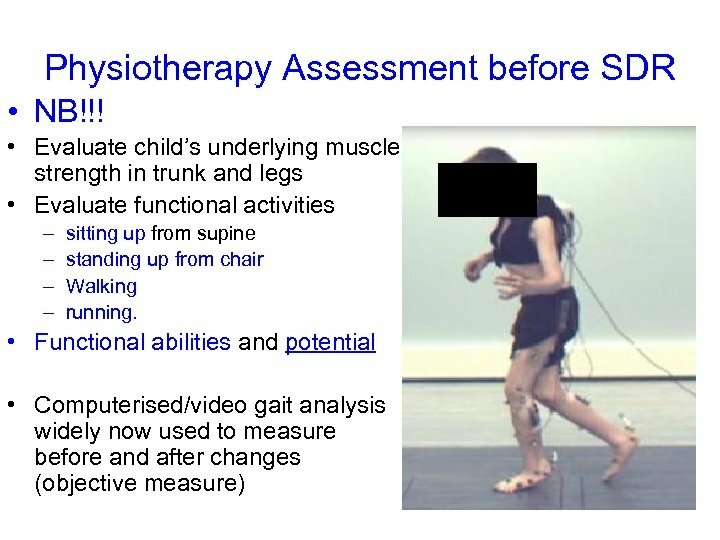 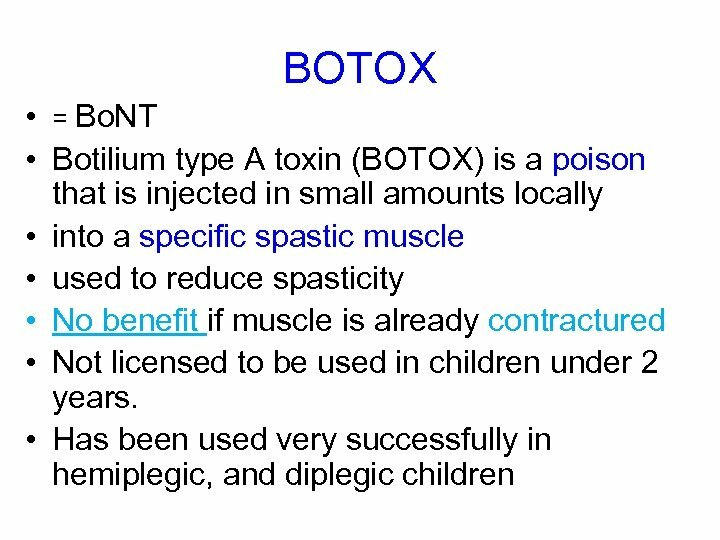 Dealing with severe spasticity in a child with neurological dysfunction a huge problem especially when it limits functional abilities.
? 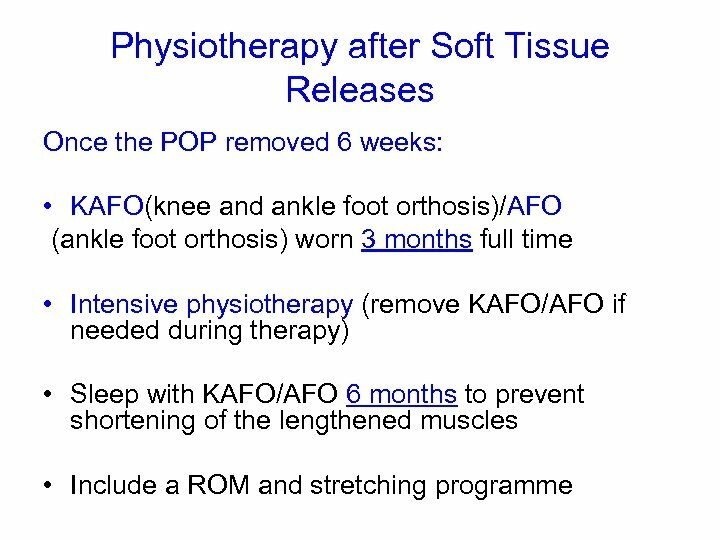 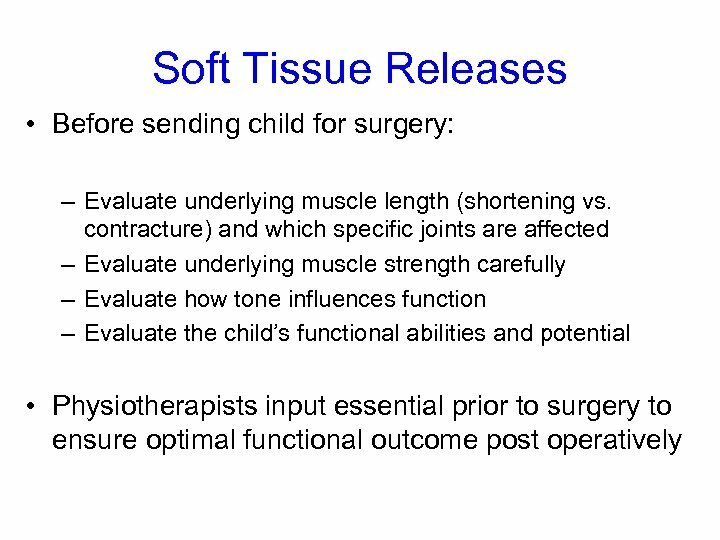 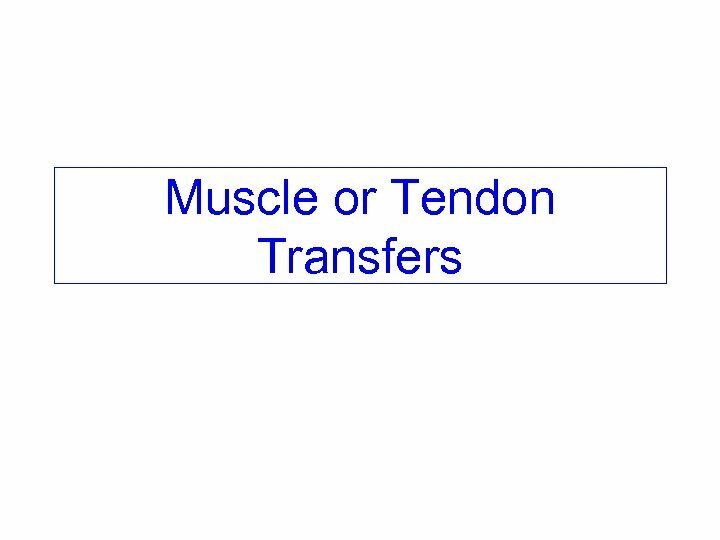 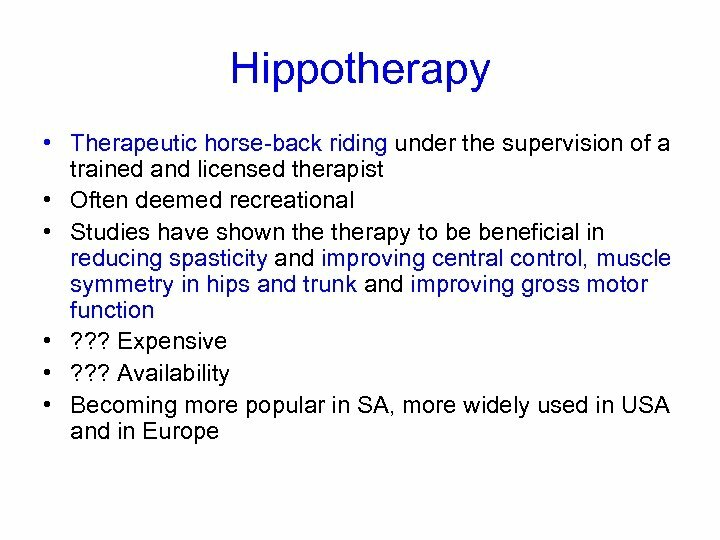 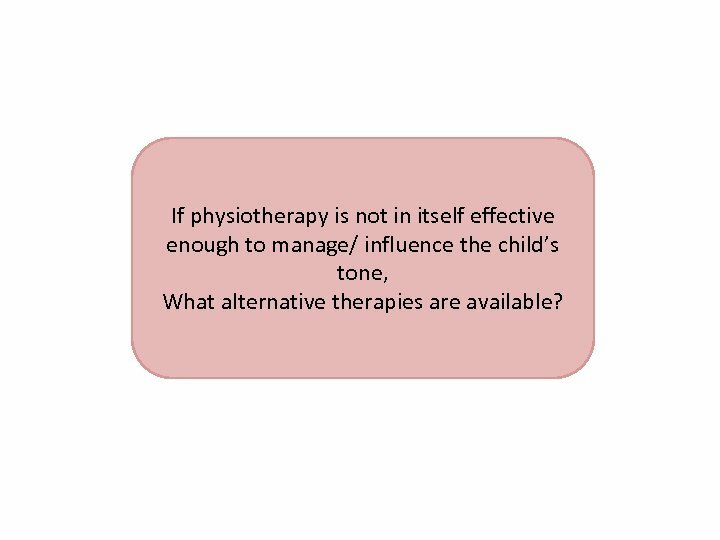 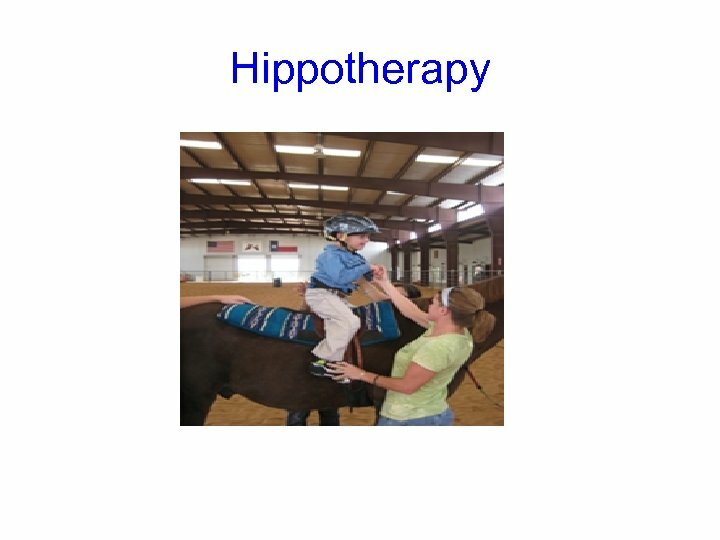 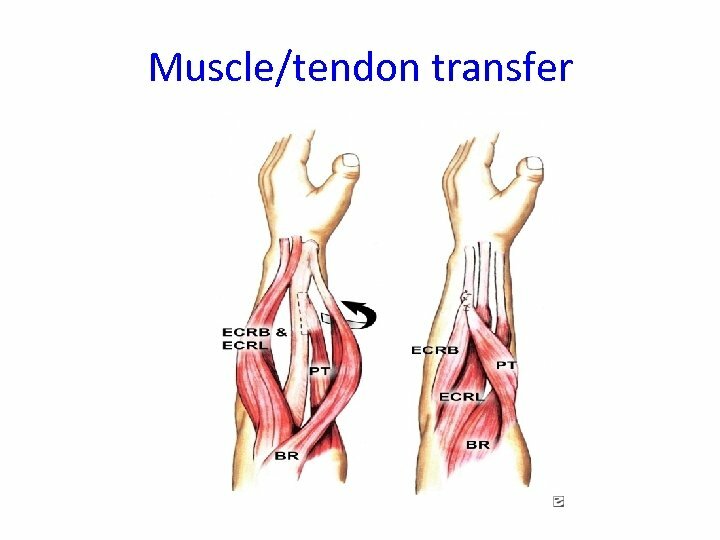 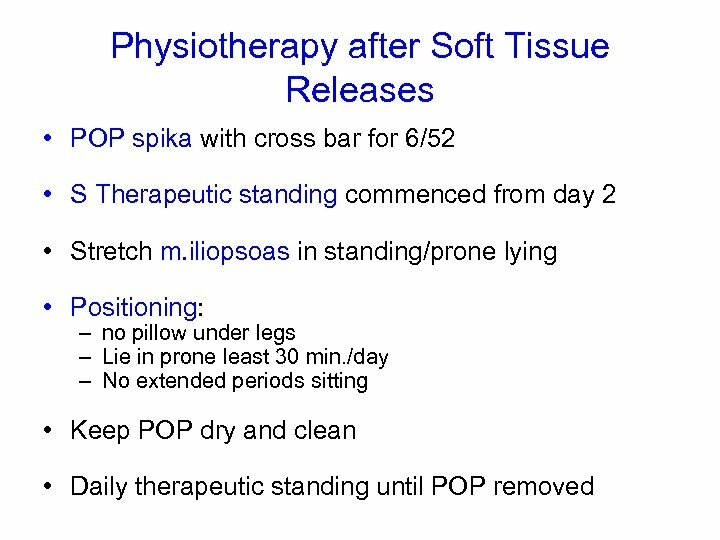 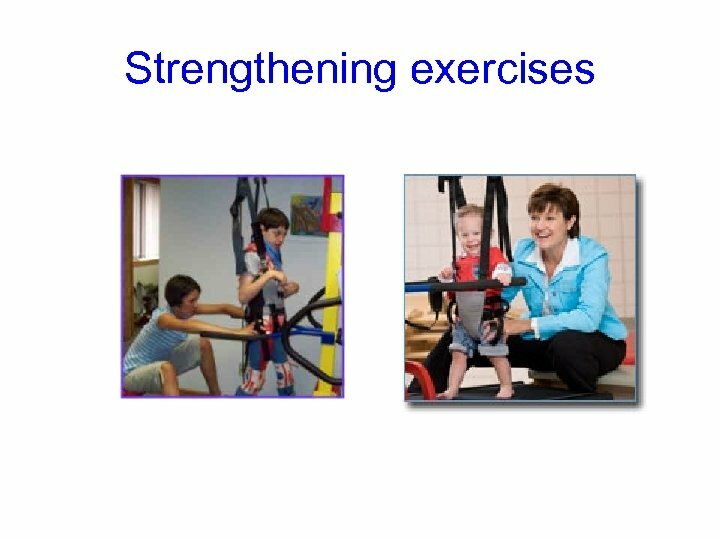 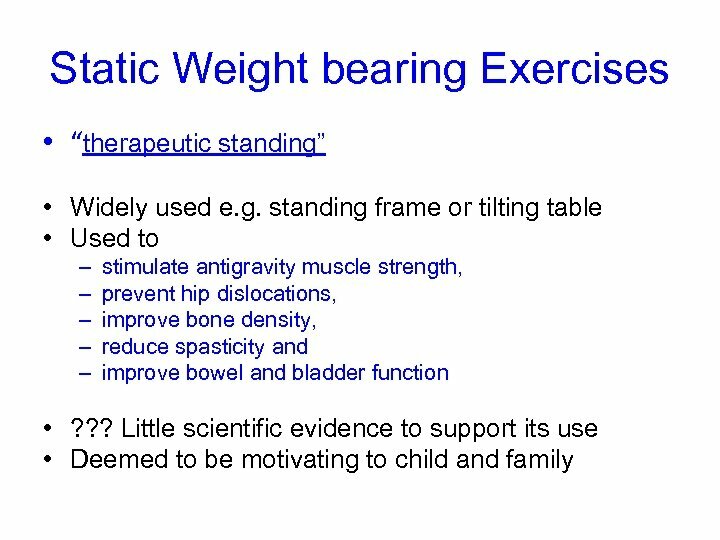 If physiotherapy is not in itself effective enough to manage/ influence the child’s tone, What alternative therapies are available? 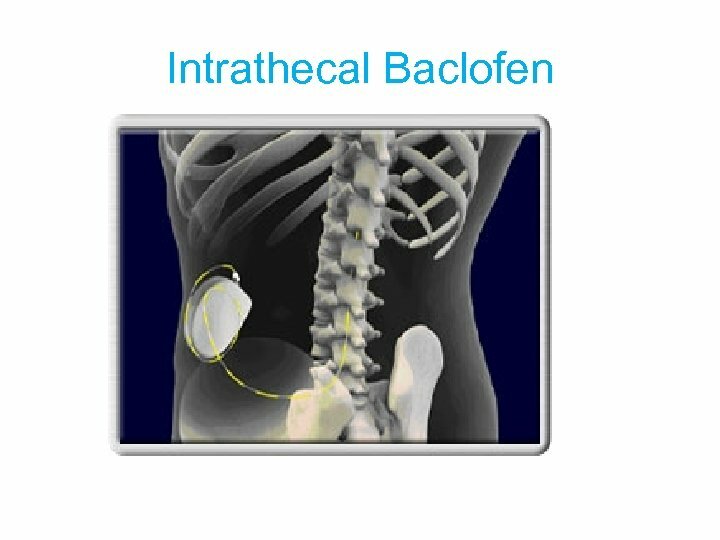 Intrathecal Baclofen • Use of implantable, programmable pump • To deliver precise amounts of Baclofen directly to the site of action at the spinal cord via the CSF • Precise action of Baclofen as a muscle relaxant and antispasmodic agent is not fully understood. 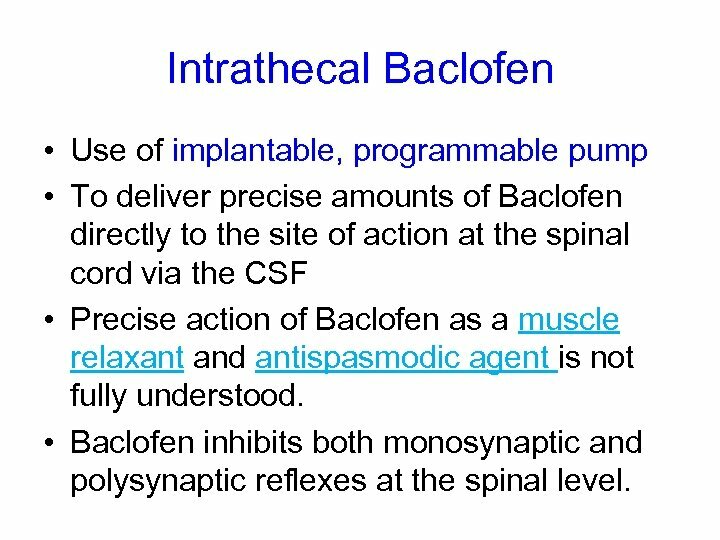 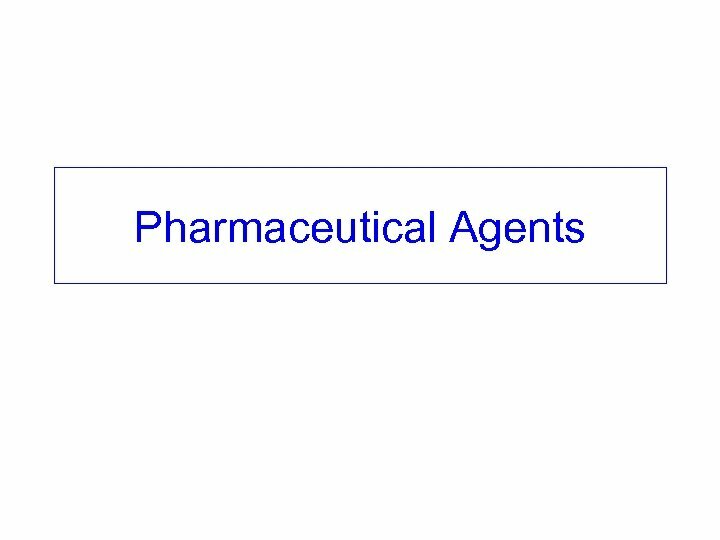 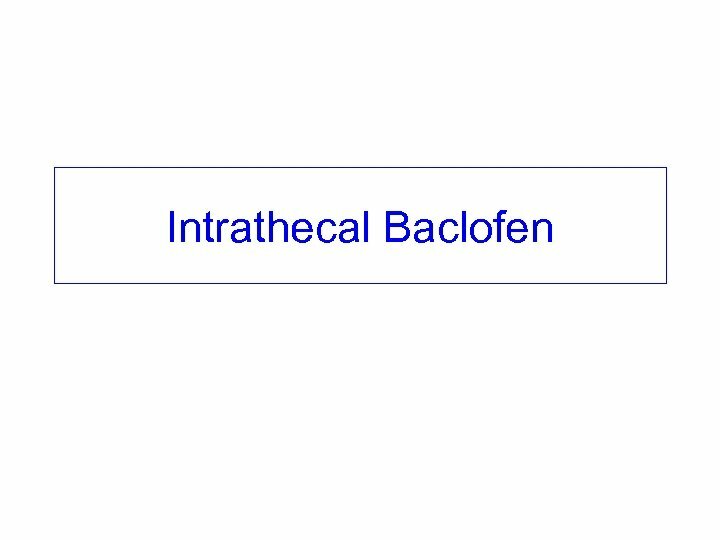 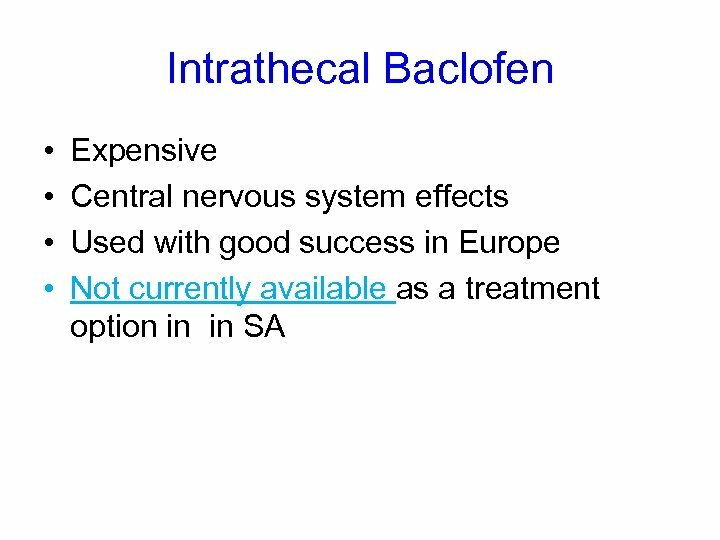 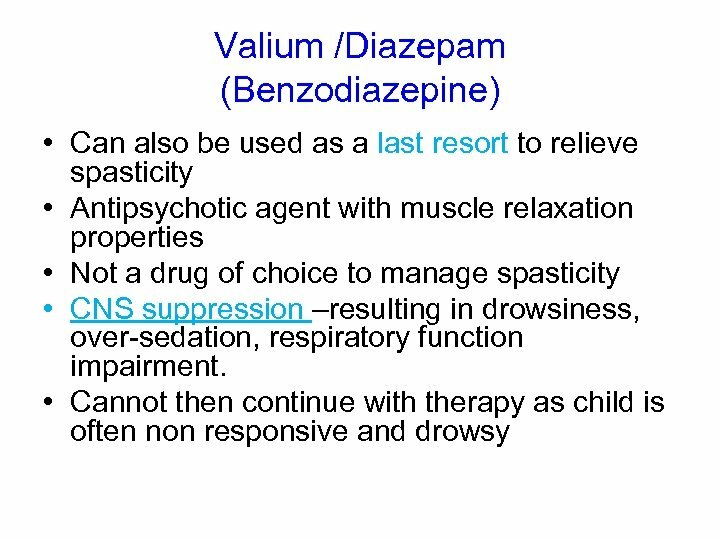 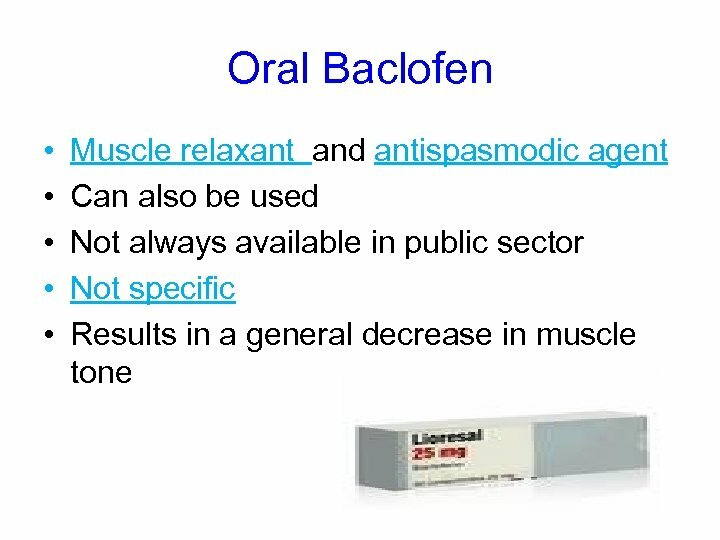 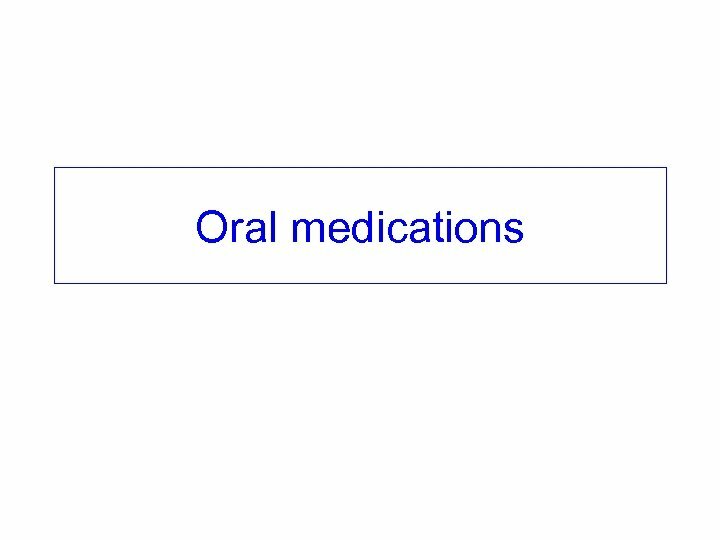 • Baclofen inhibits both monosynaptic and polysynaptic reflexes at the spinal level. 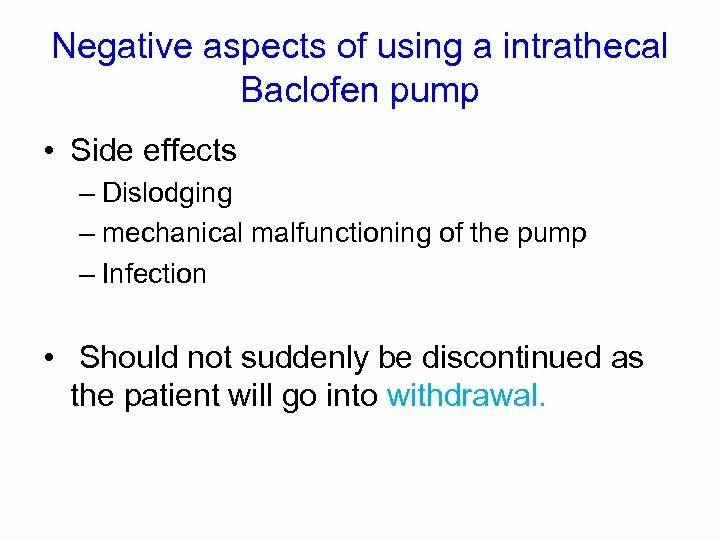 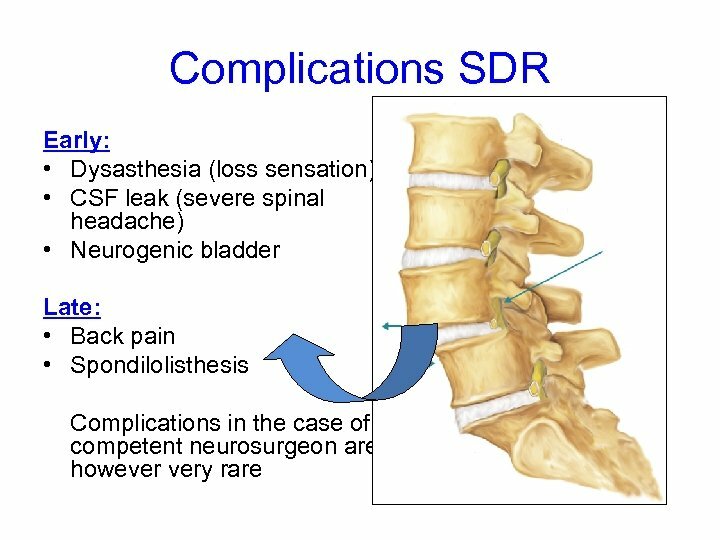 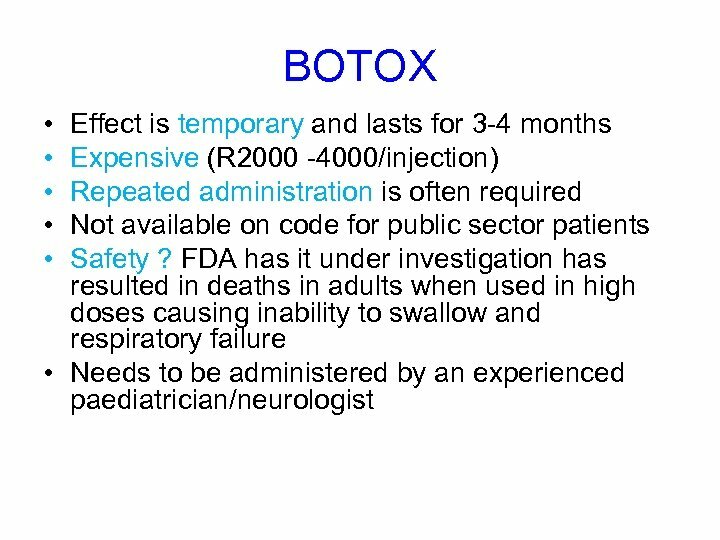 Negative aspects of using a intrathecal Baclofen pump • Side effects – Dislodging – mechanical malfunctioning of the pump – Infection • Should not suddenly be discontinued as the patient will go into withdrawal. 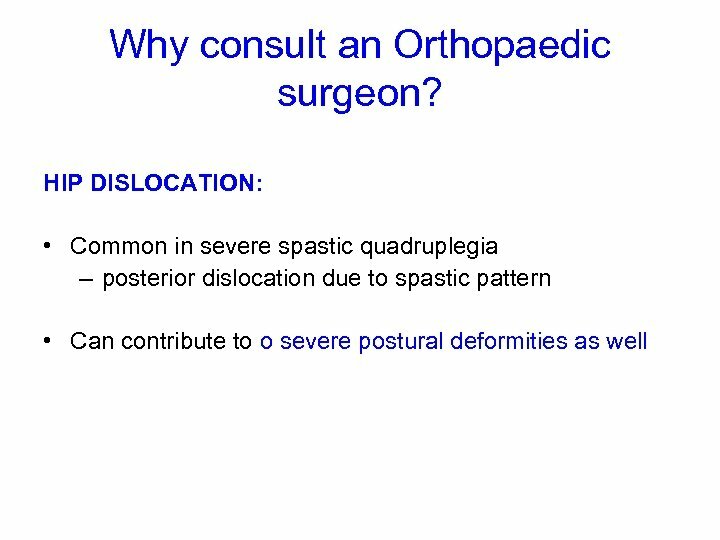 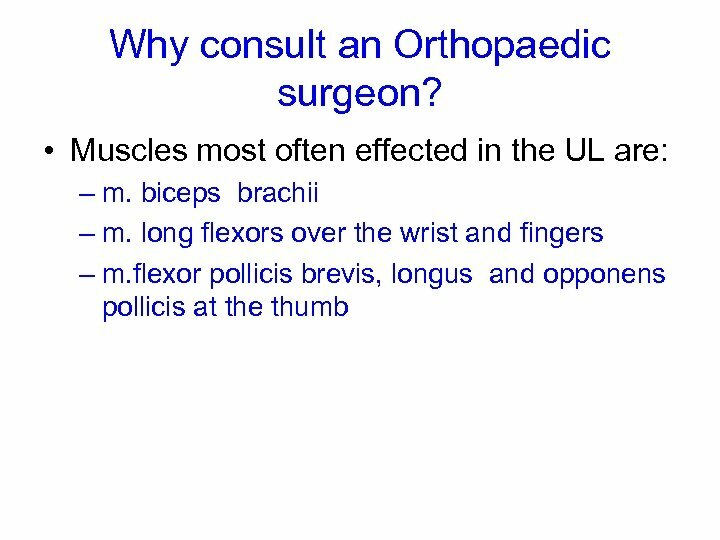 Why consult an Orthopaedic surgeon? 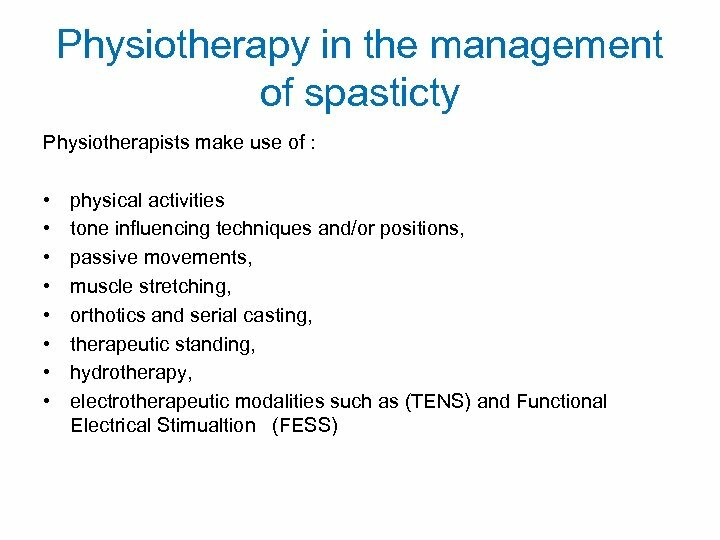 SPASTICITY • Often severe spasticity, poor biomechanics and muscle imbalances lead to contracturing of the soft tissue and muscles • Can also lead to postural and joint deformities. 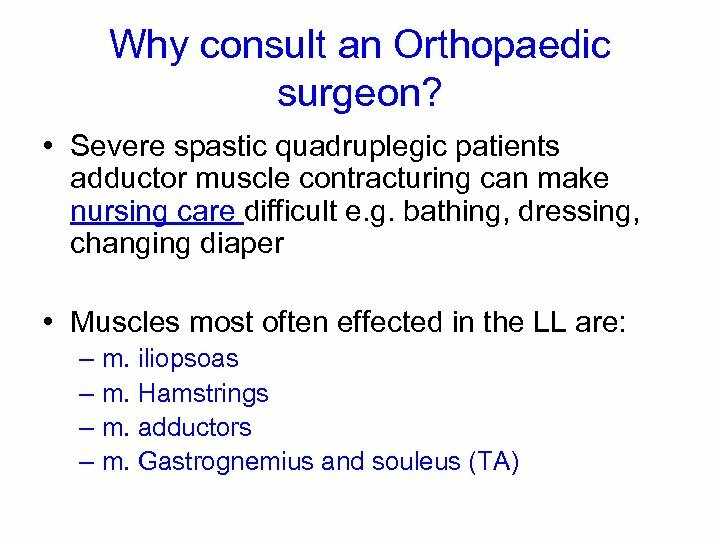 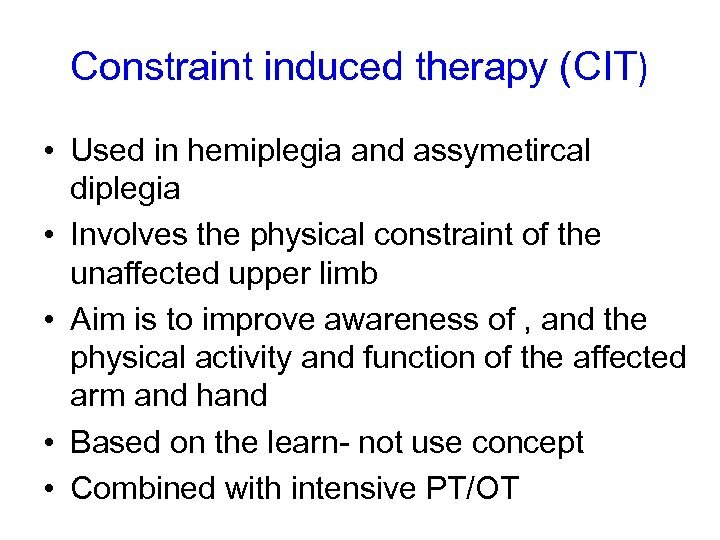 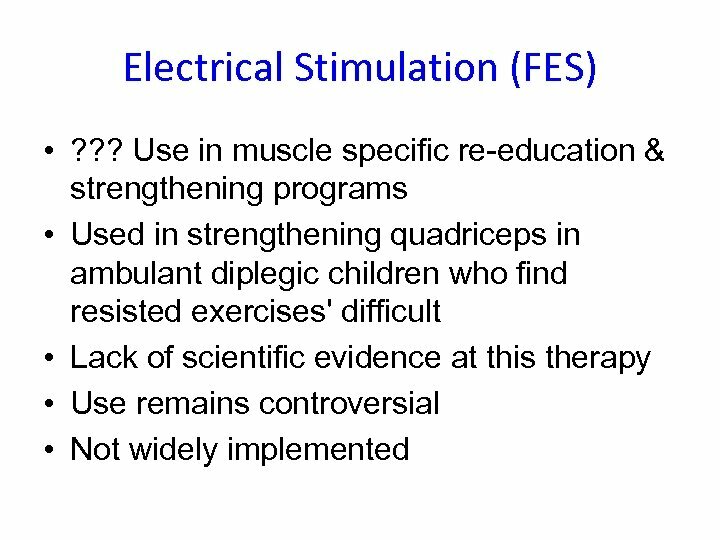 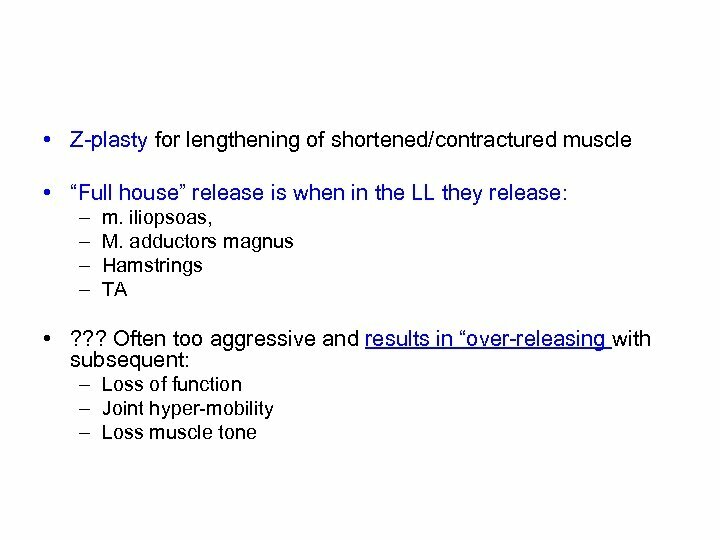 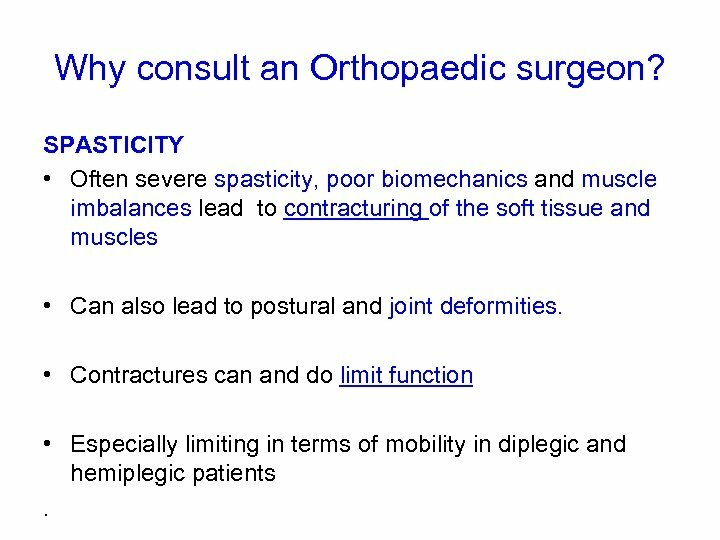 • Contractures can and do limit function • Especially limiting in terms of mobility in diplegic and hemiplegic patients. 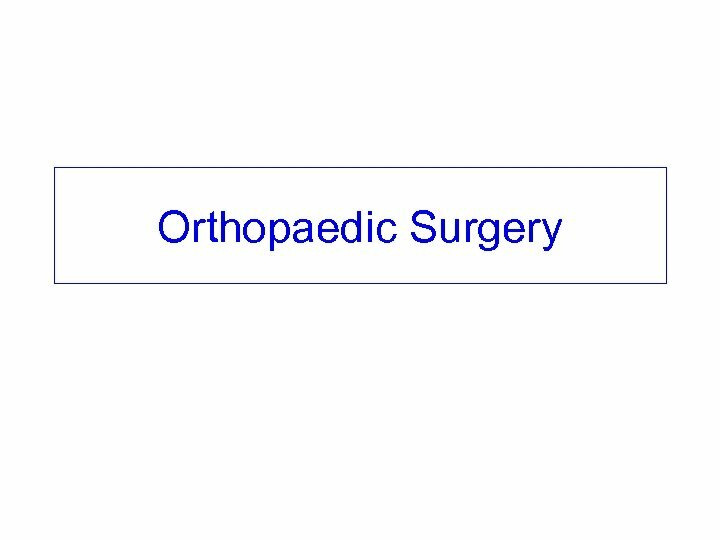 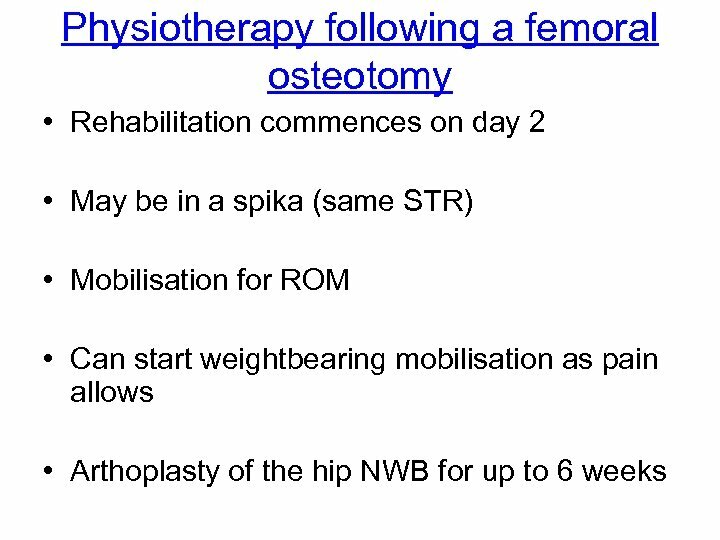 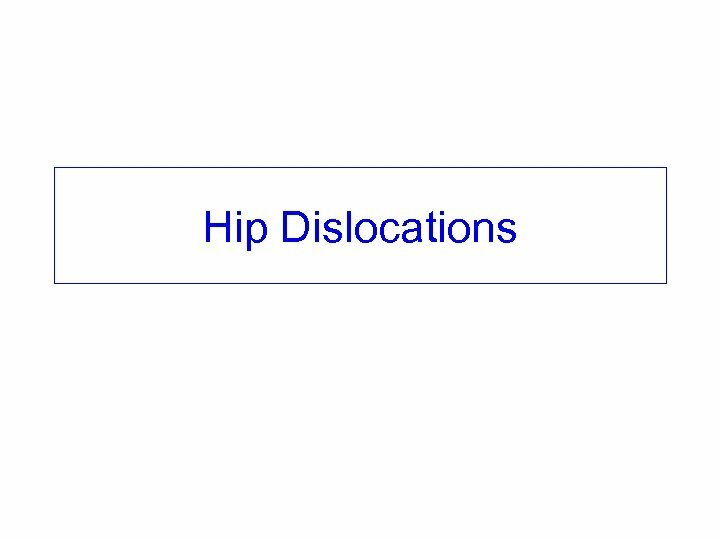 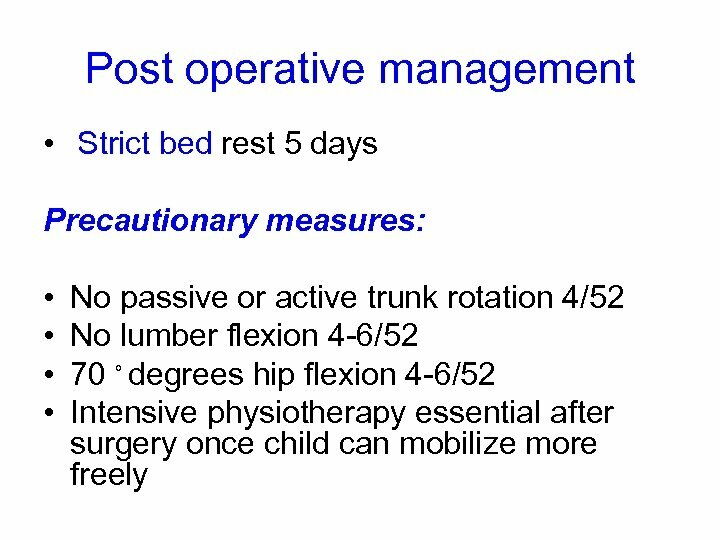 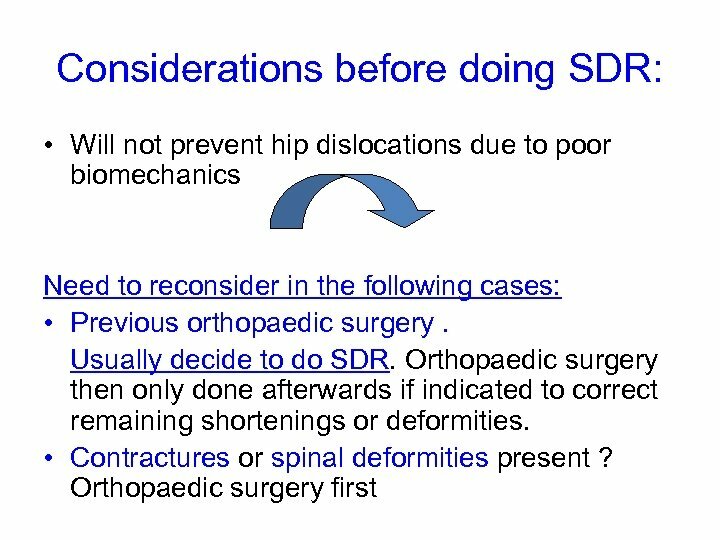 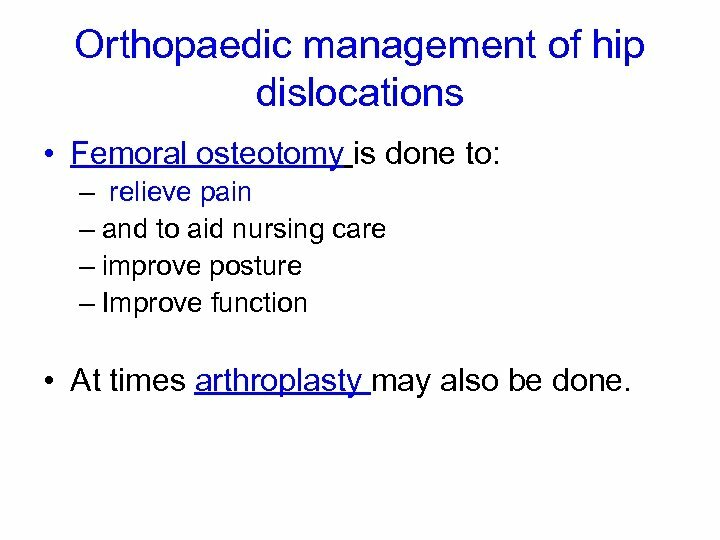 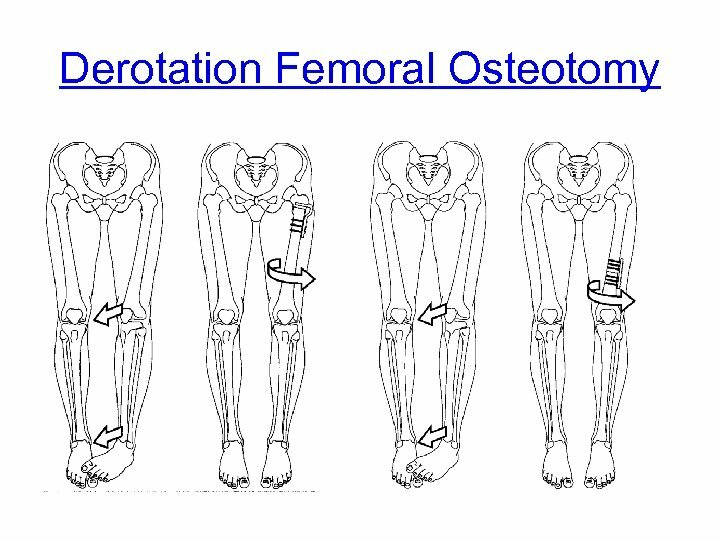 Orthopaedic management of hip dislocations • Femoral osteotomy is done to: – relieve pain – and to aid nursing care – improve posture – Improve function • At times arthroplasty may also be done. 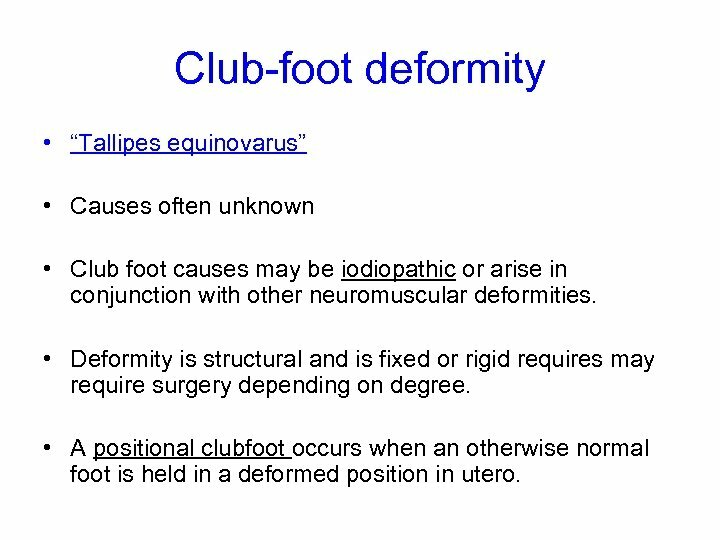 Club-foot deformity • “Tallipes equinovarus” • Causes often unknown • Club foot causes may be iodiopathic or arise in conjunction with other neuromuscular deformities. 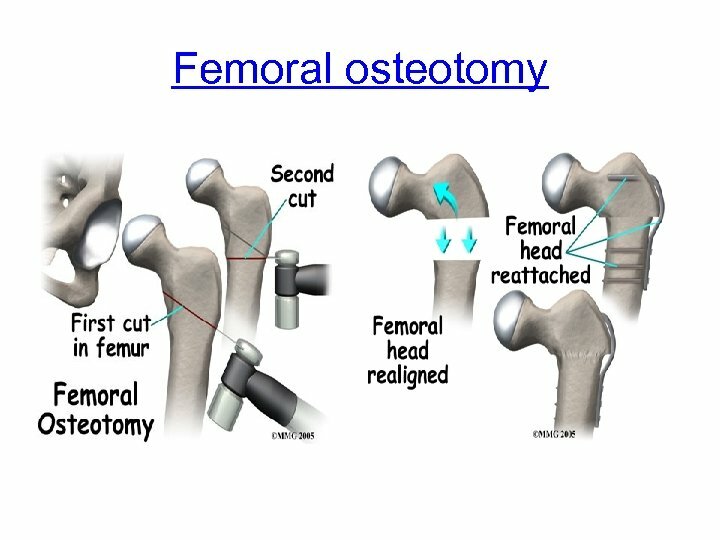 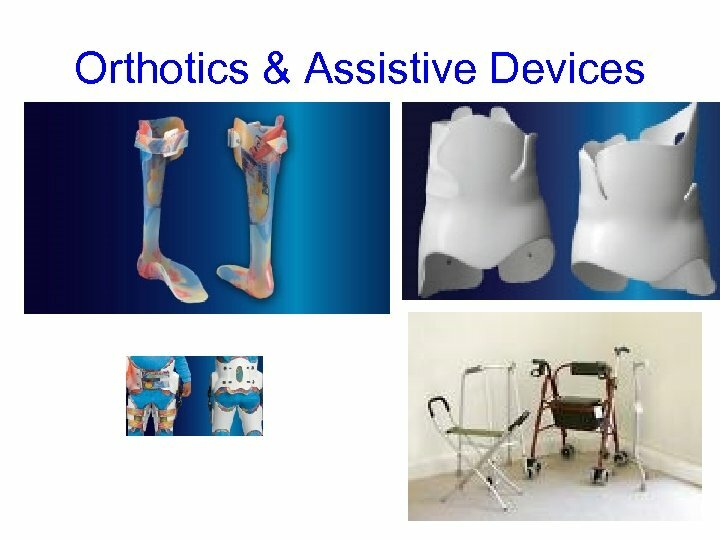 • Deformity is structural and is fixed or rigid requires may require surgery depending on degree. 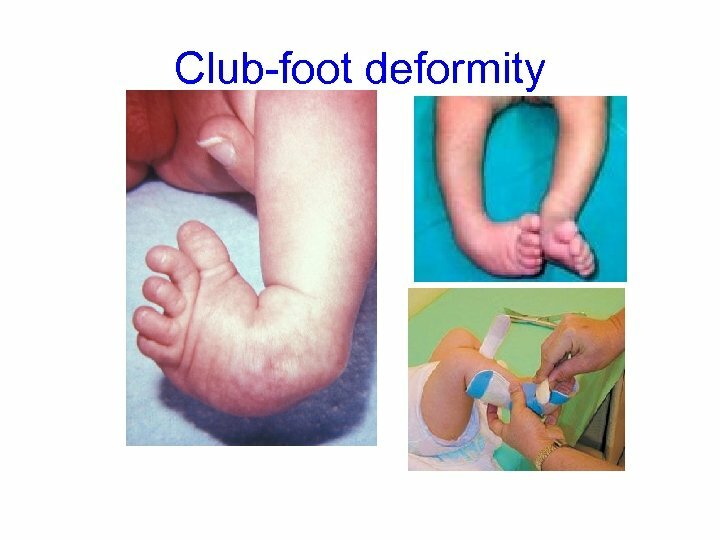 • A positional clubfoot occurs when an otherwise normal foot is held in a deformed position in utero. 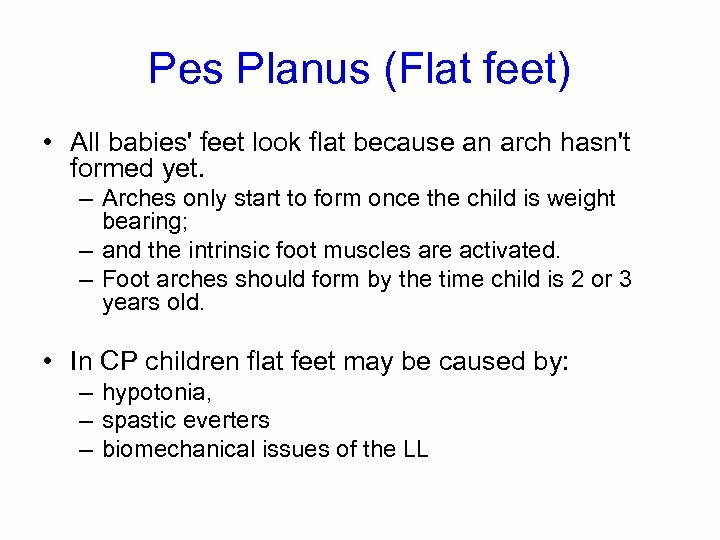 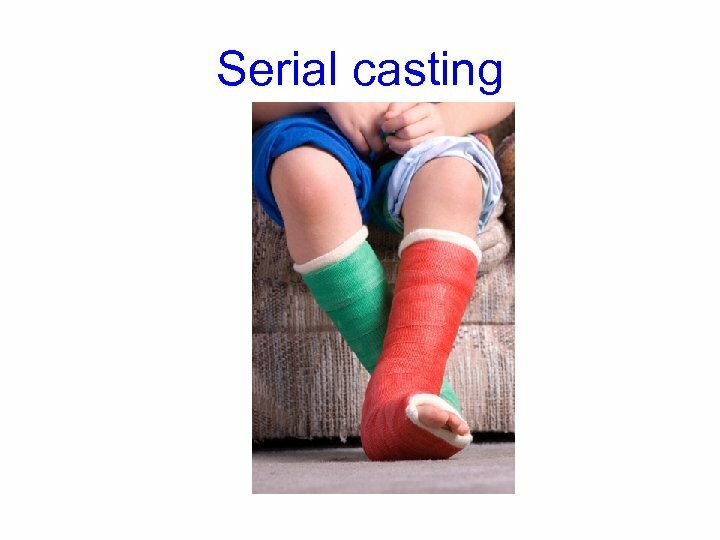 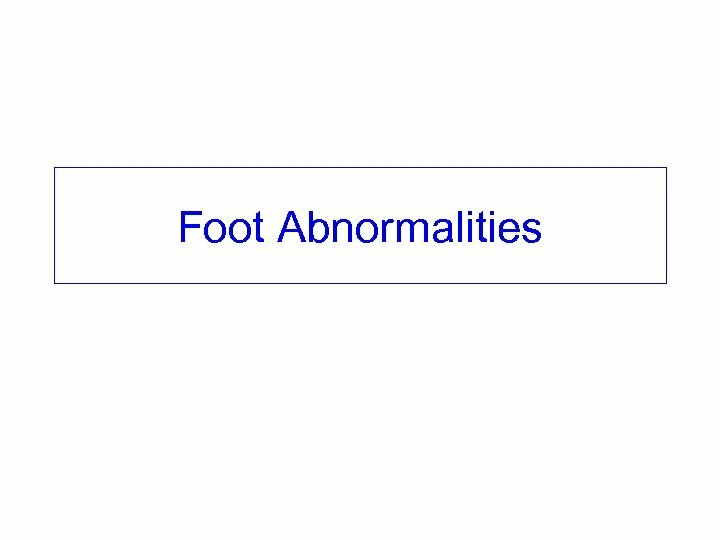 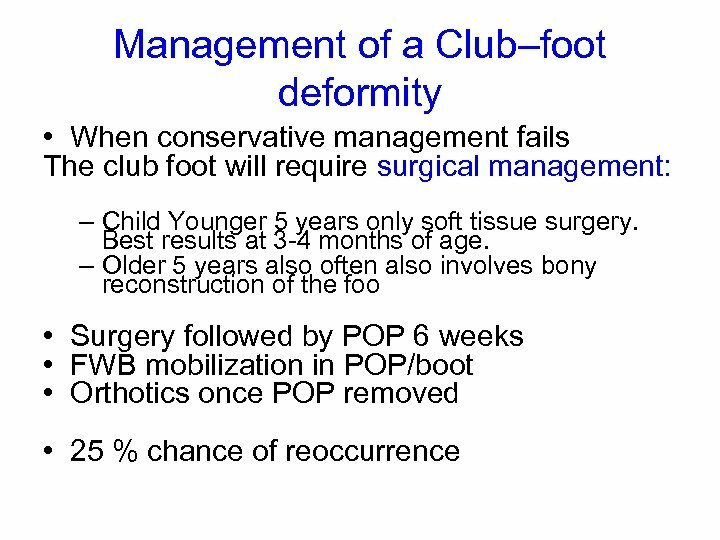 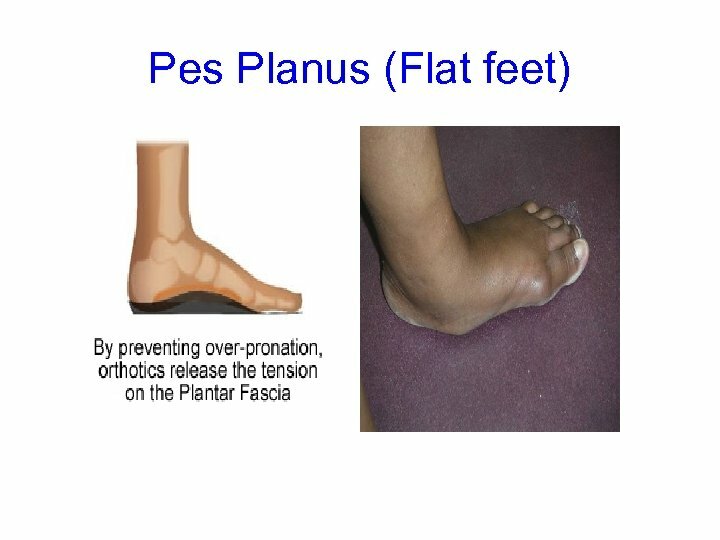 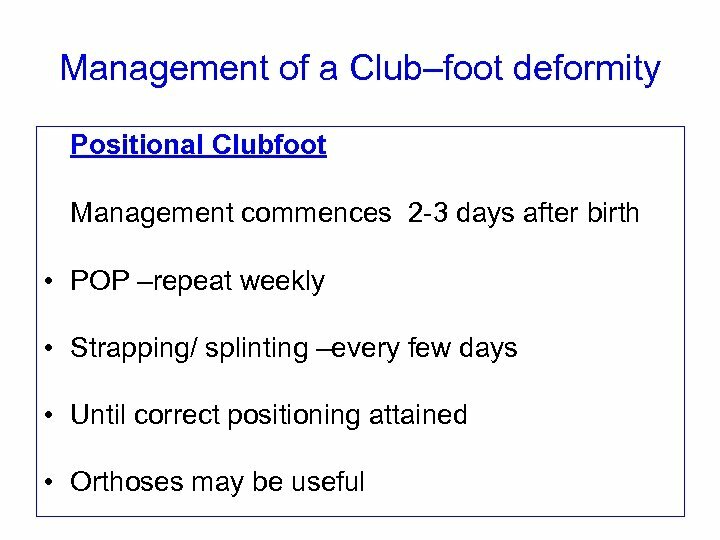 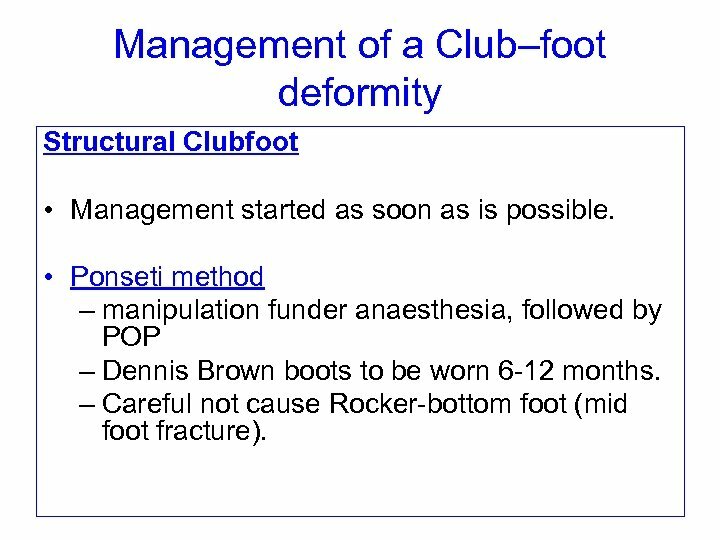 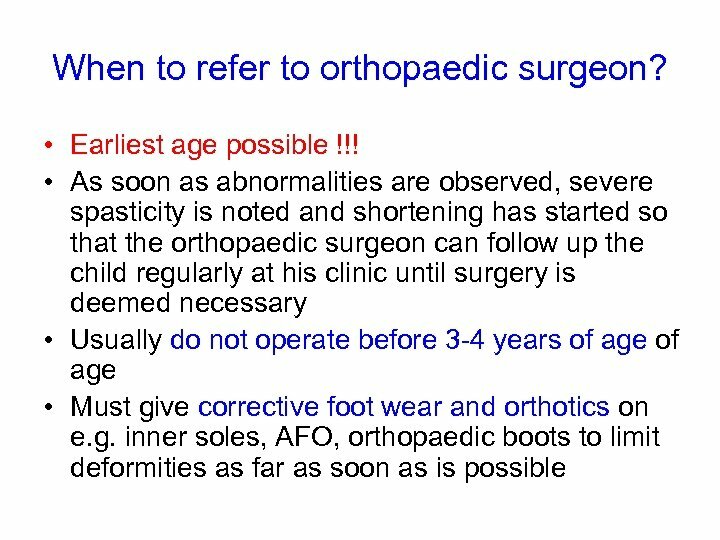 Management of a Club–foot deformity Structural Clubfoot • Management started as soon as is possible. 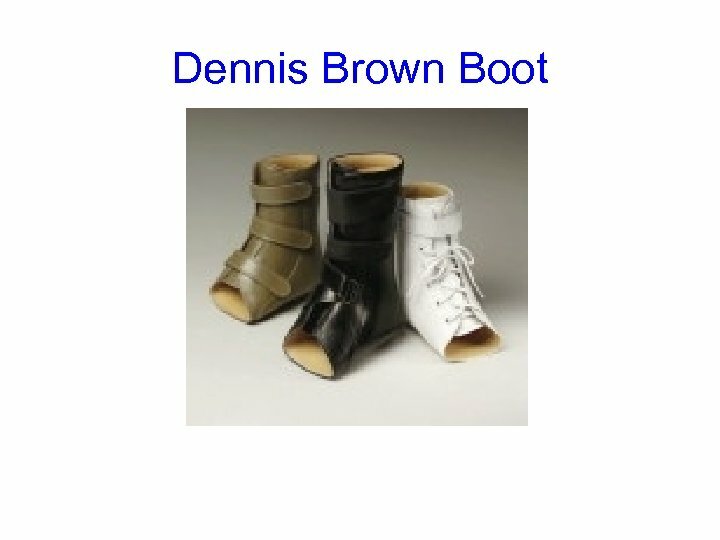 • Ponseti method – manipulation funder anaesthesia, followed by POP – Dennis Brown boots to be worn 6 -12 months. 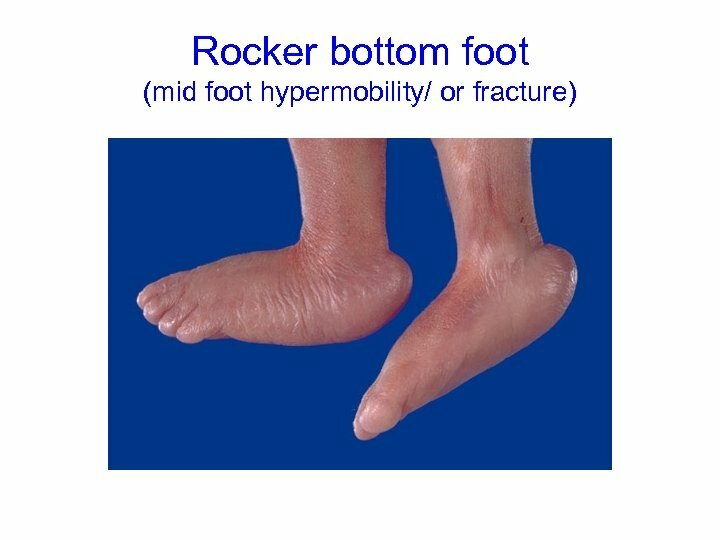 – Careful not cause Rocker-bottom foot (mid foot fracture). 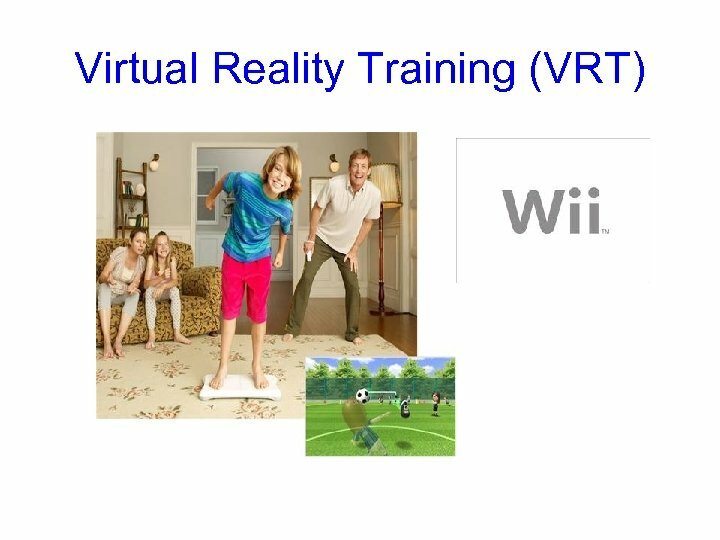 What do I tell a parent who wants to try it ? 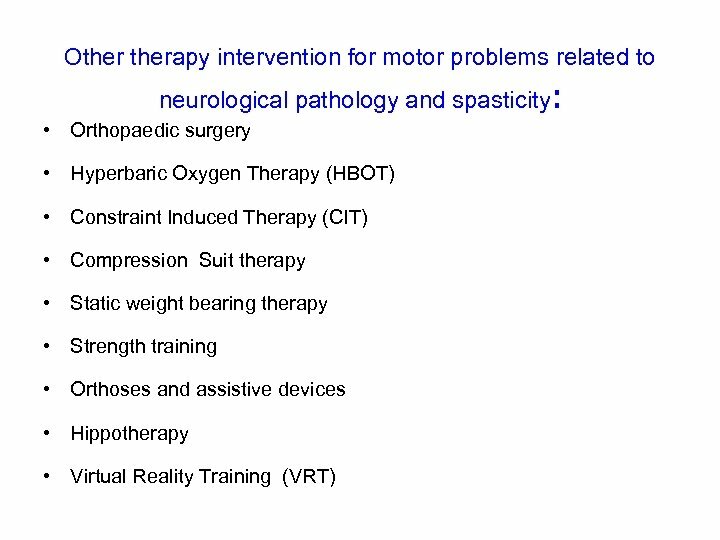 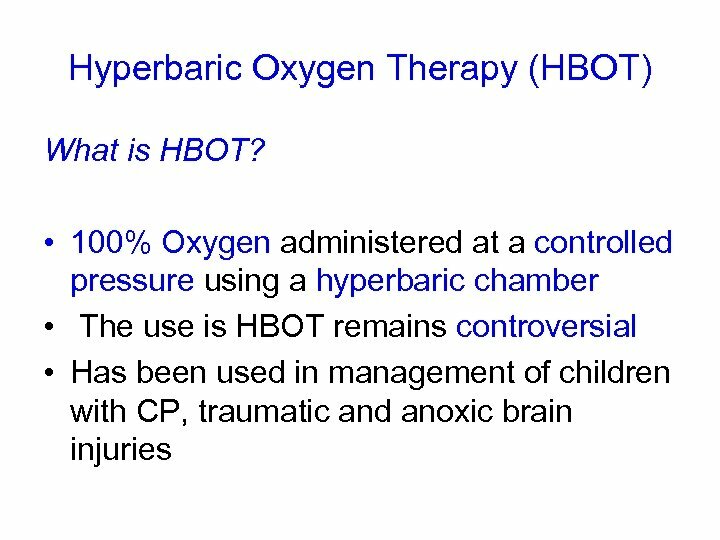 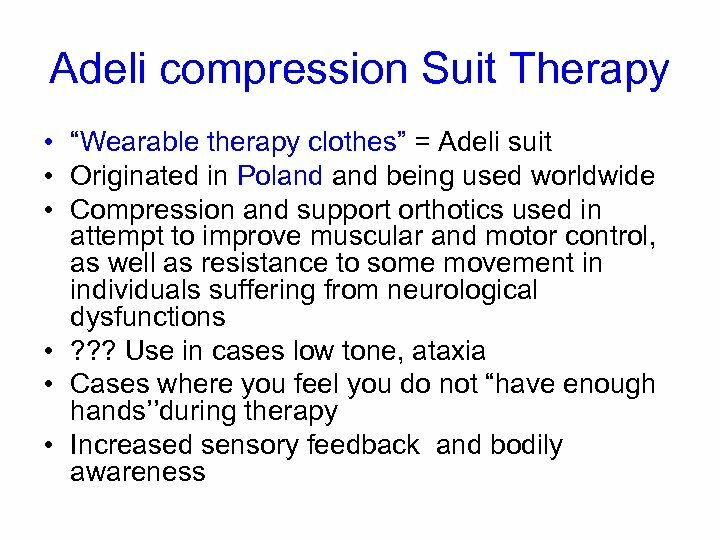 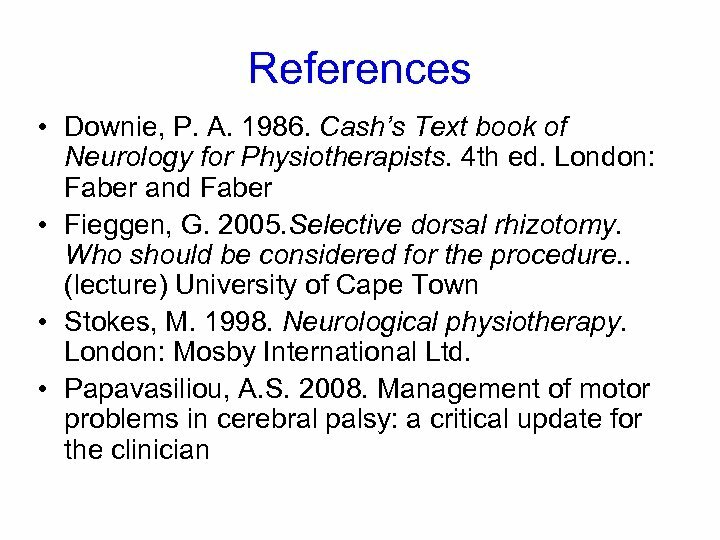 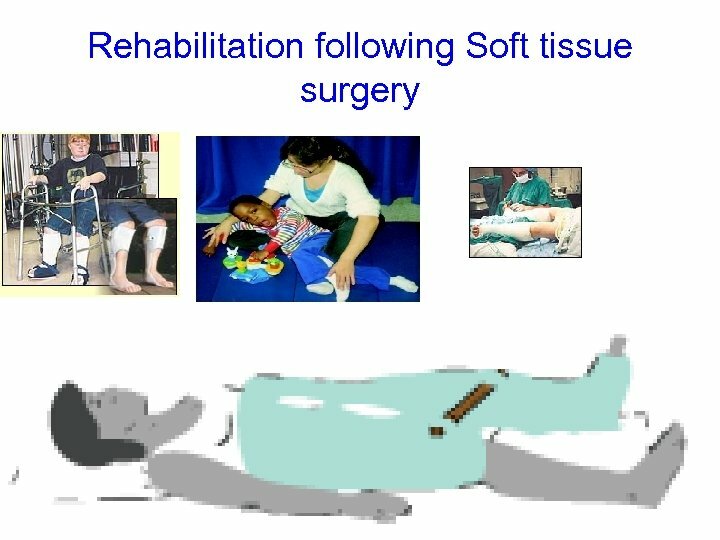 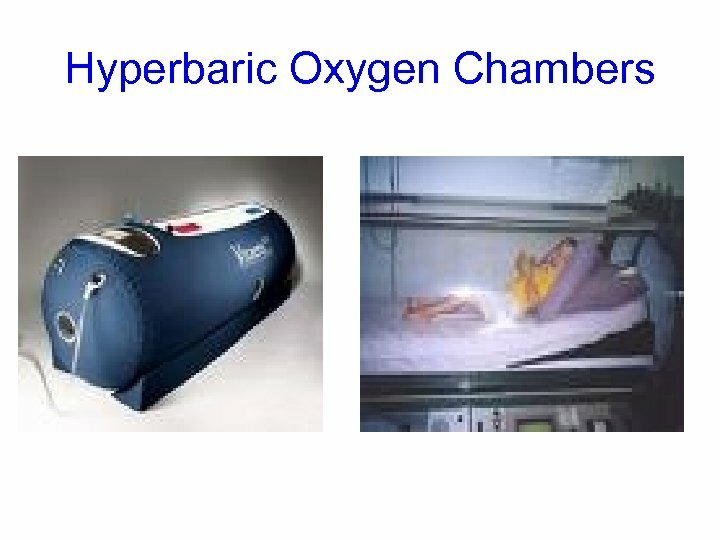 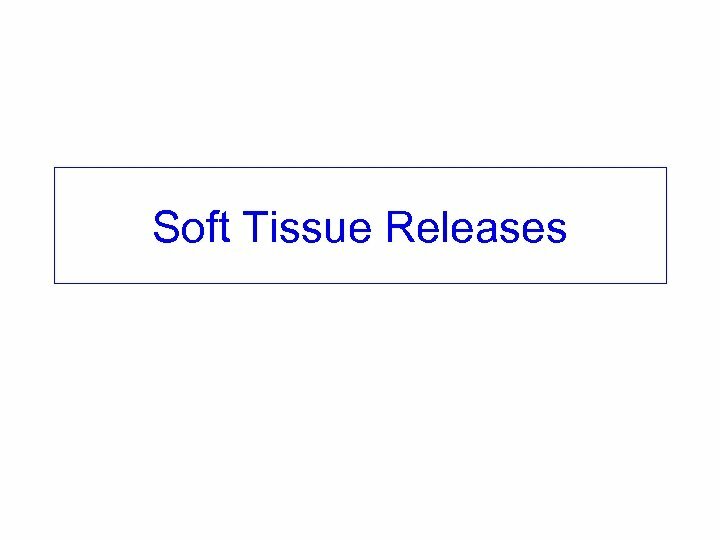 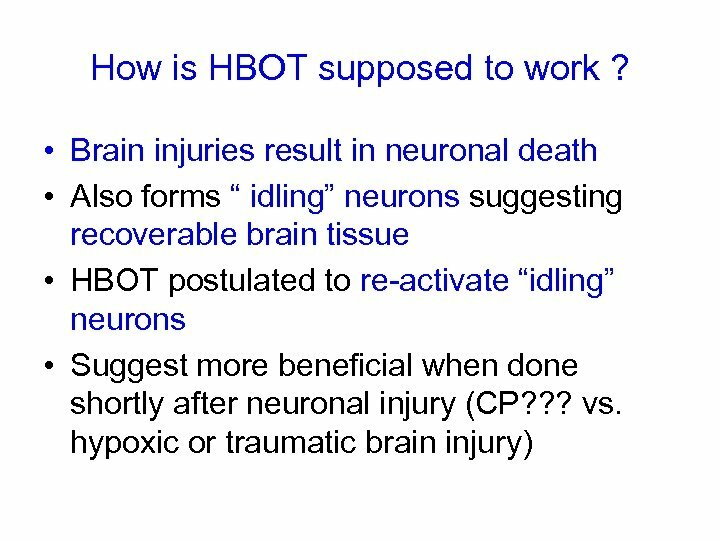 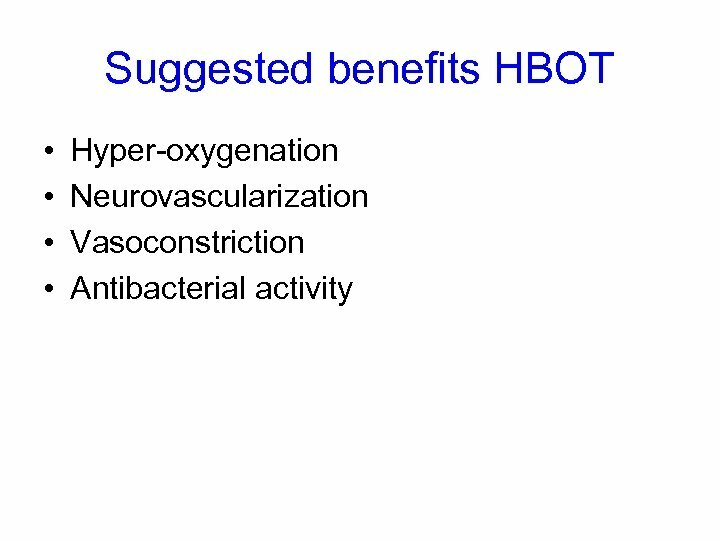 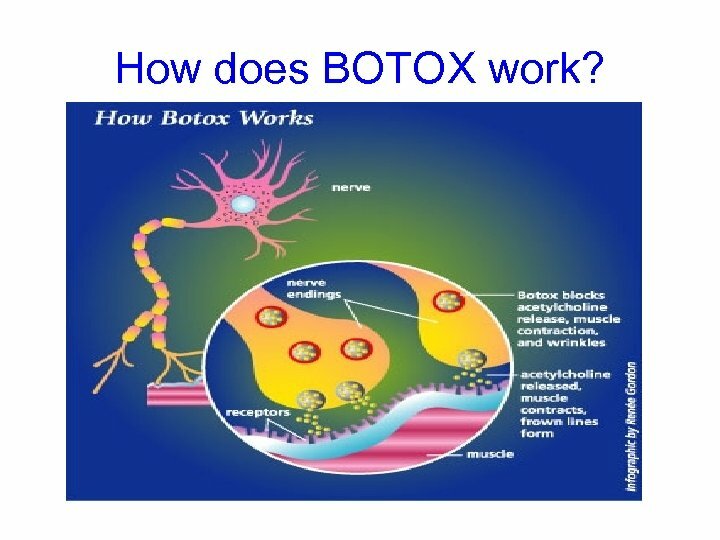 • Current research about HBOT efficacy in the management of neuronal injury is inconclusive Research studies results are very contradictive. 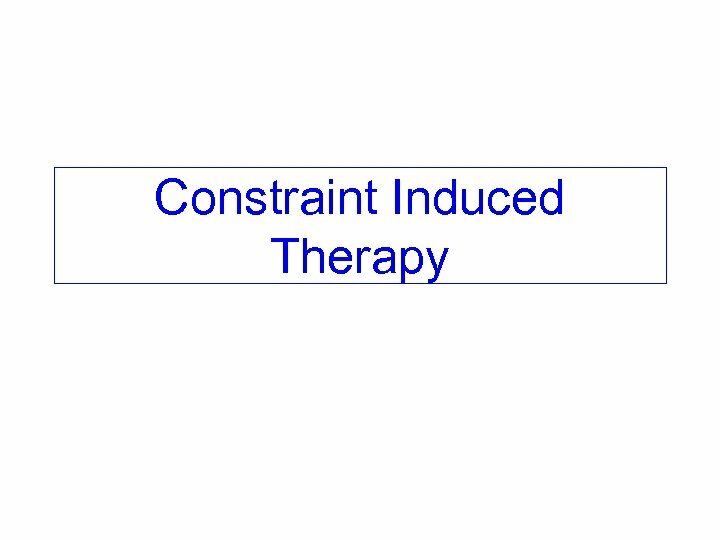 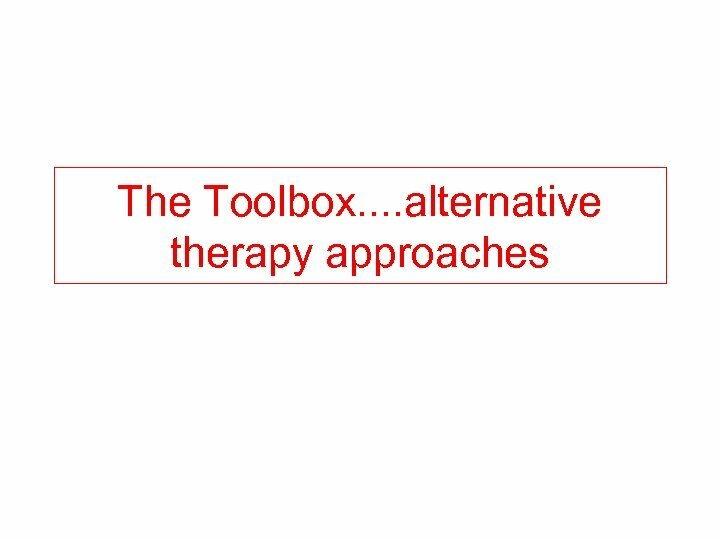 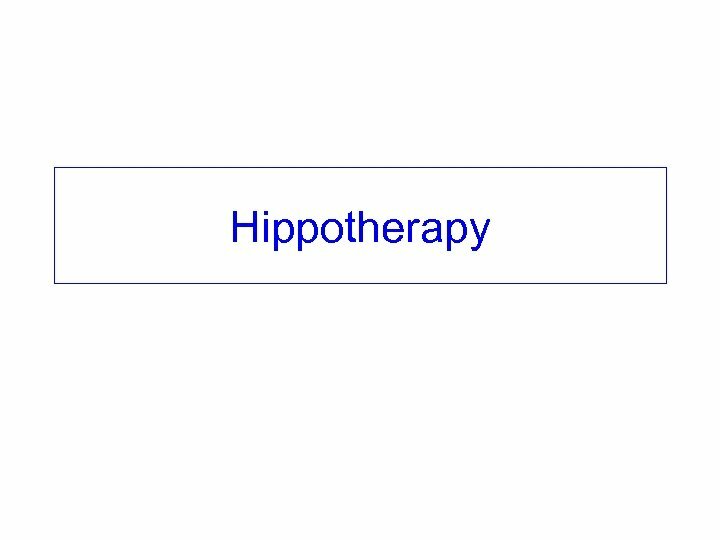 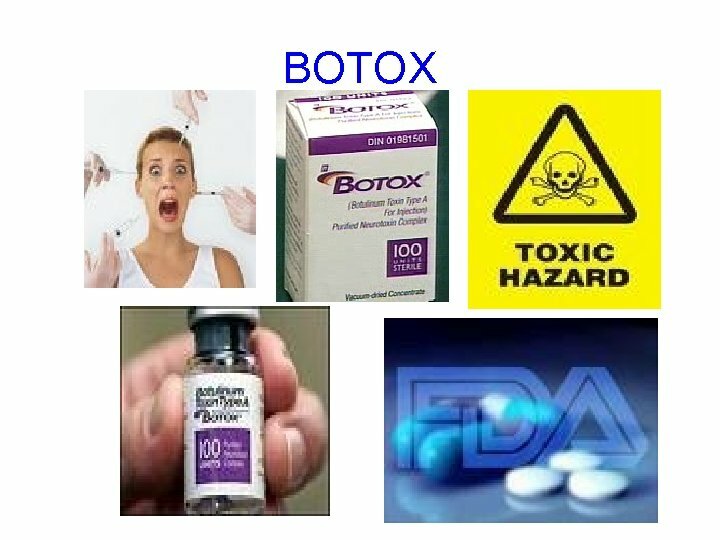 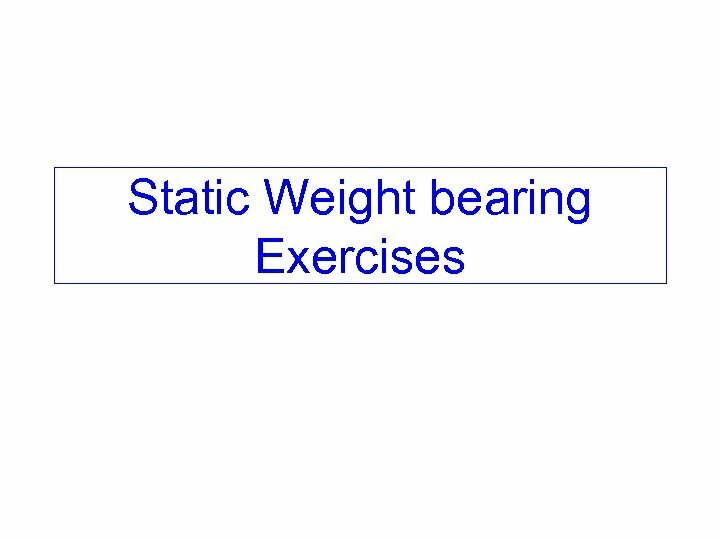 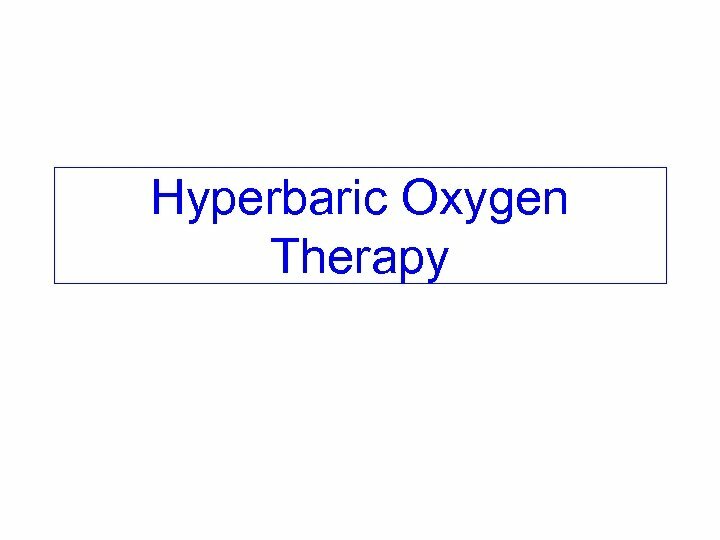 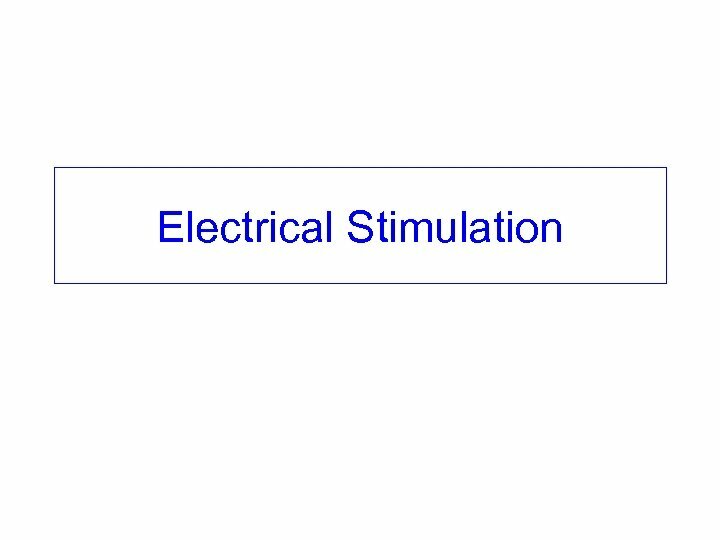 • Not widely used any more as adjunct to therapy. 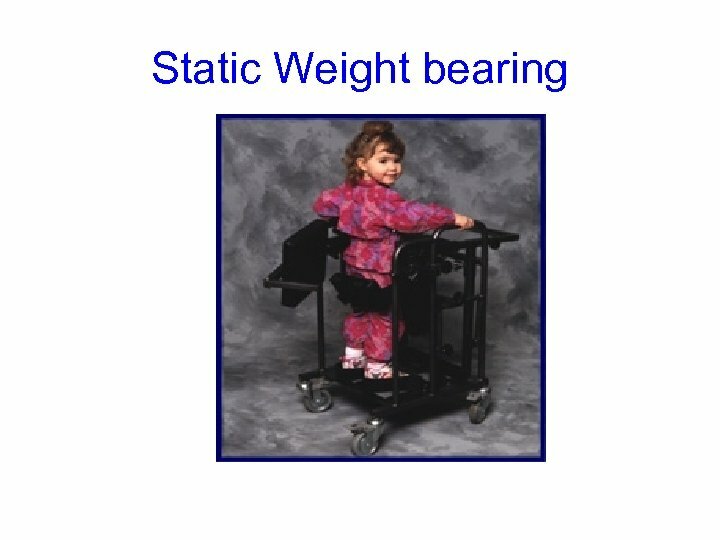 Not as fashionable any more. 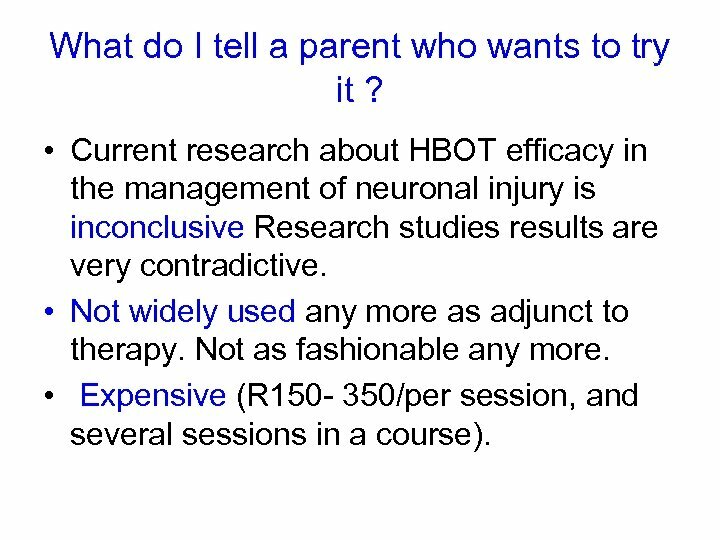 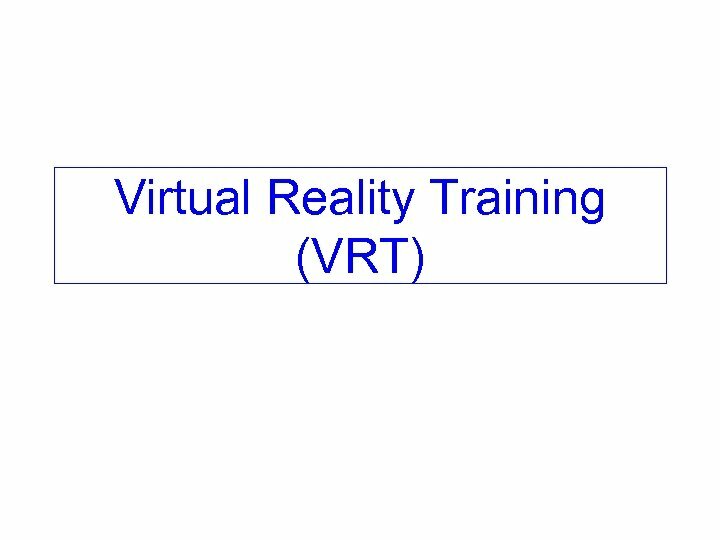 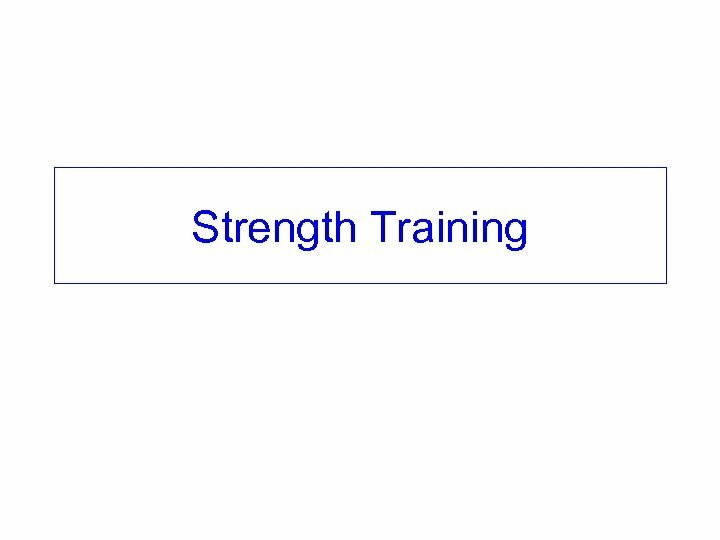 • Expensive (R 150 - 350/per session, and several sessions in a course). 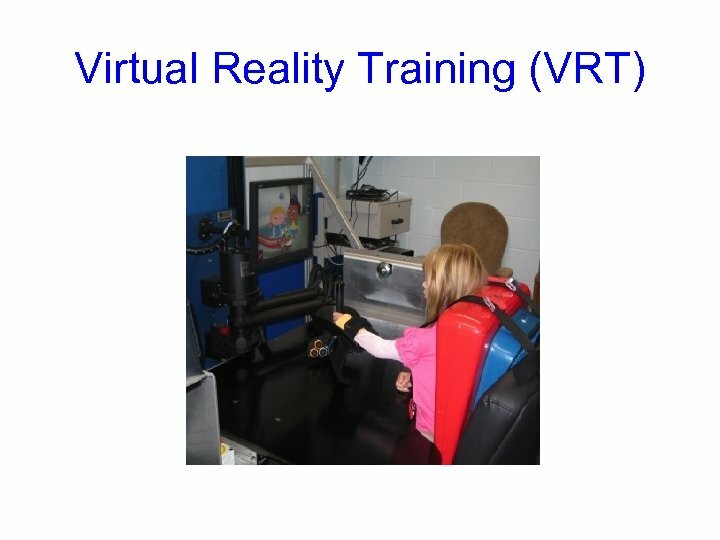 What do I tell a parent who wants to try it ? 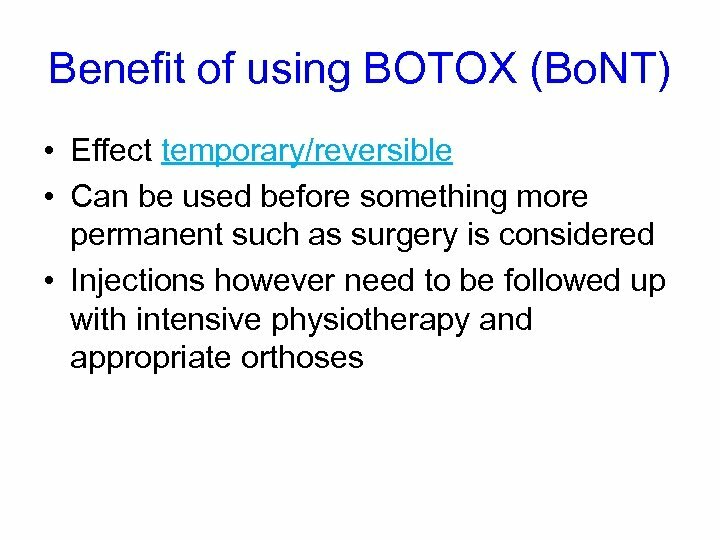 • Definitely give it a try ! 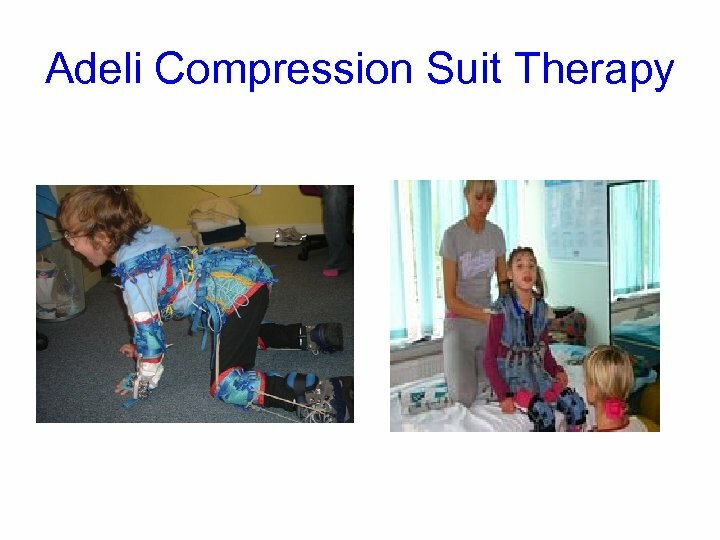 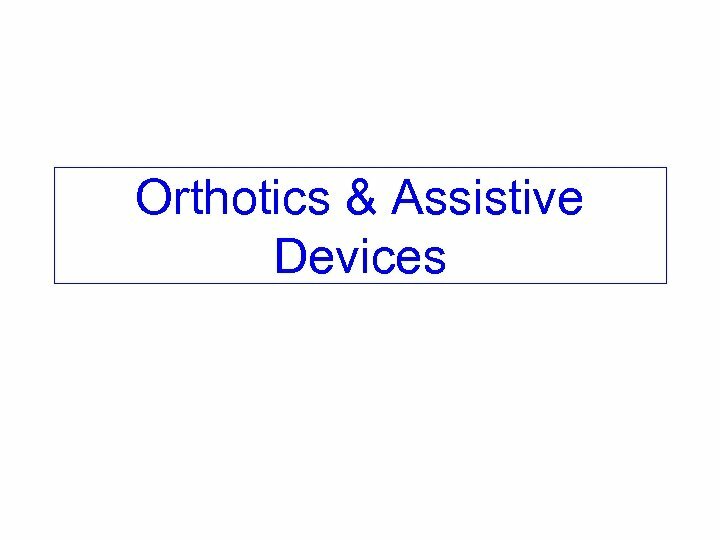 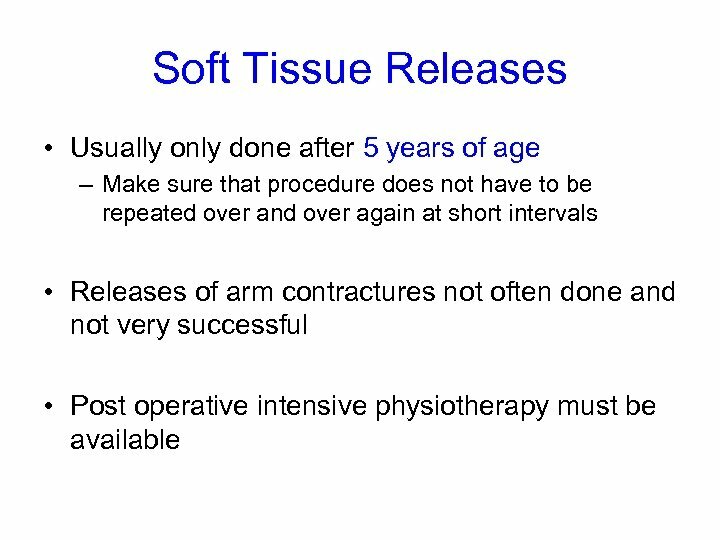 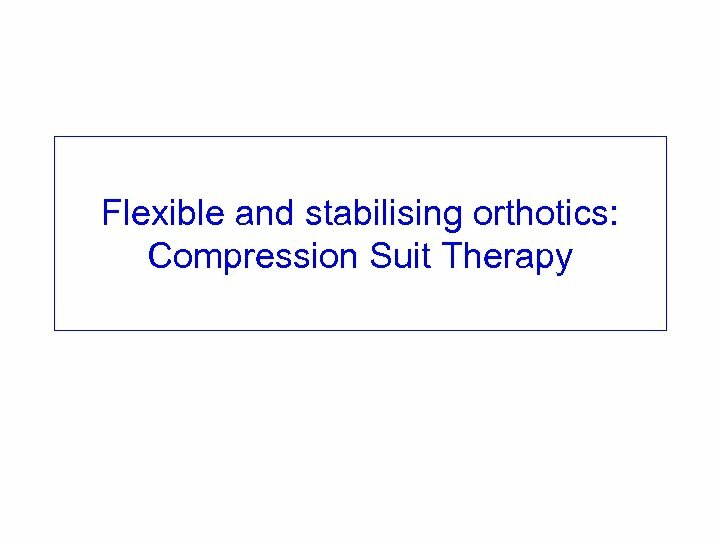 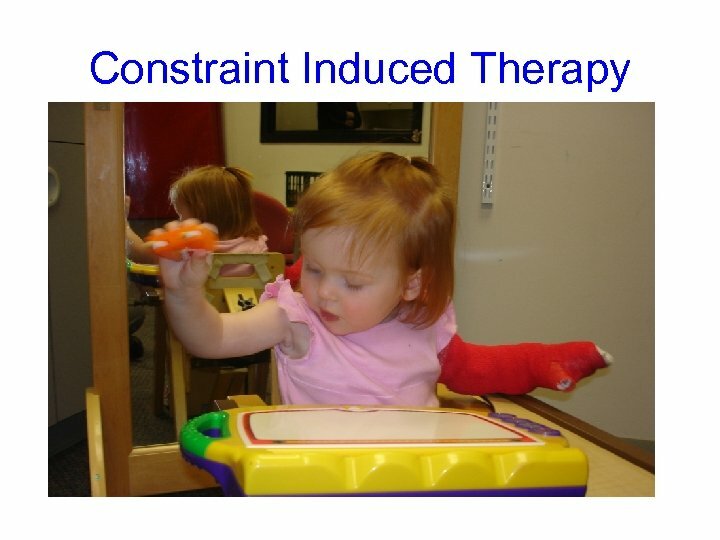 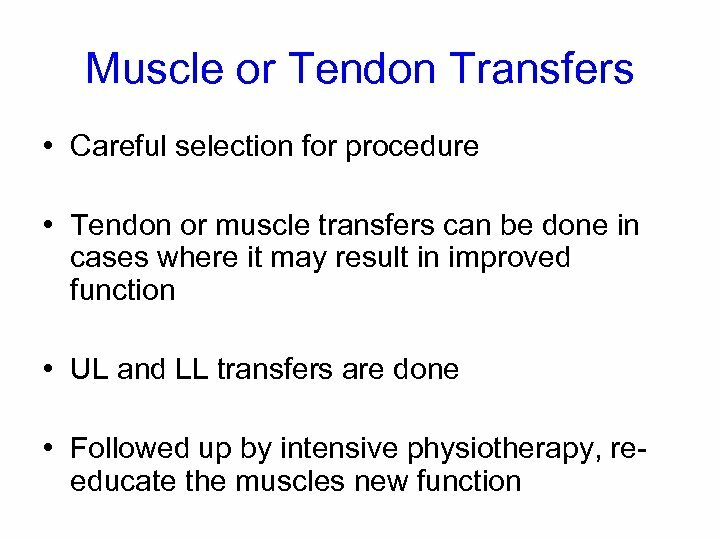 • Use a bandage/immobi-sling/neoprene splint • Labour intensive for parent/therapist got to be followed up with task or goal directed activity for hand • Have been some controlled clinical trial done on CIT • Research results have been promising – research has shown improved use of the arm and hand to lesser extent • More clinical trial research indicated • Concerns : Often difficult to implement with a child with little active use of arm or even in cases severe hemineglect. 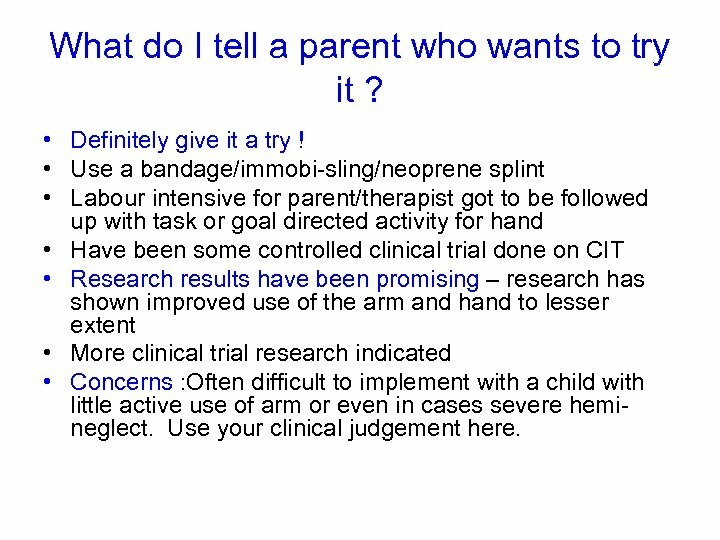 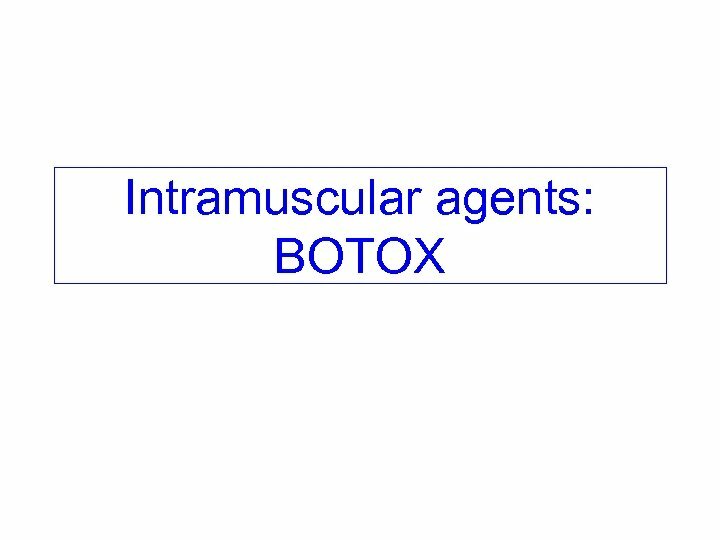 Use your clinical judgement here. 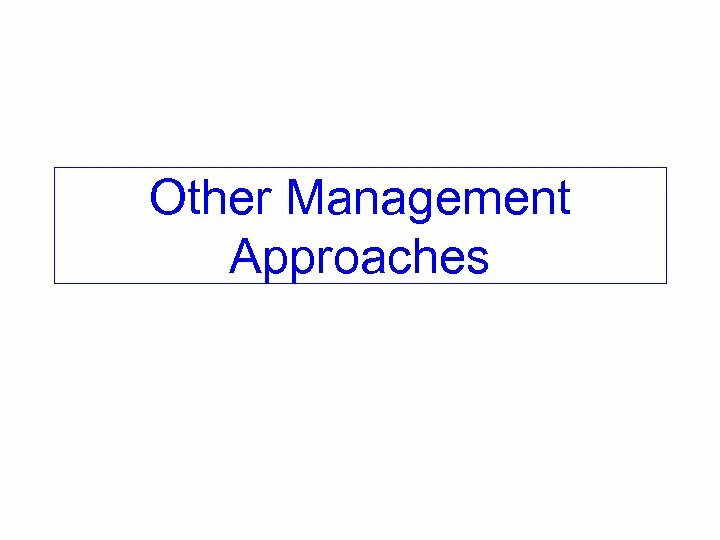 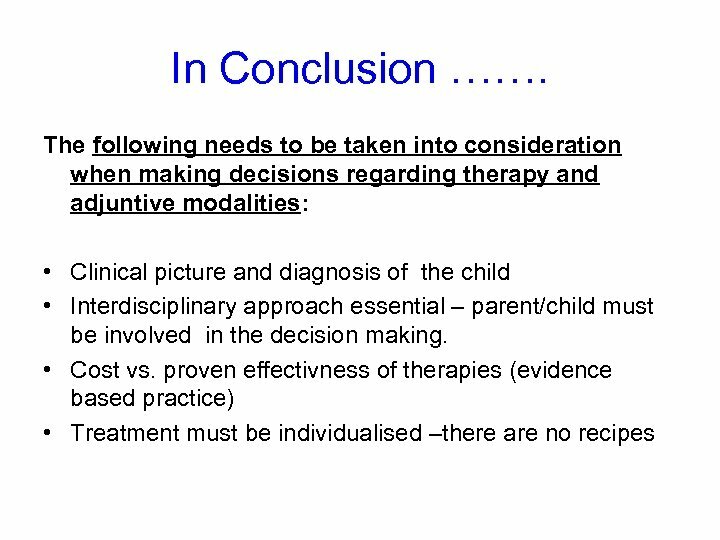 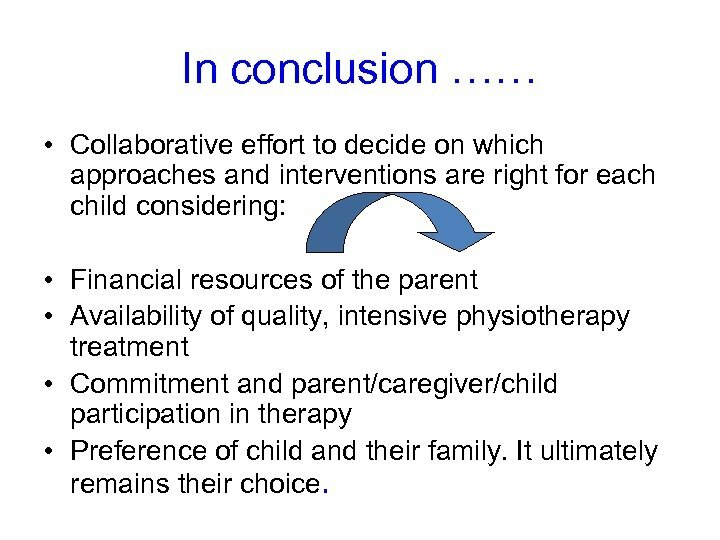 In conclusion …… • Collaborative effort to decide on which approaches and interventions are right for each child considering: • Financial resources of the parent • Availability of quality, intensive physiotherapy treatment • Commitment and parent/caregiver/child participation in therapy • Preference of child and their family. 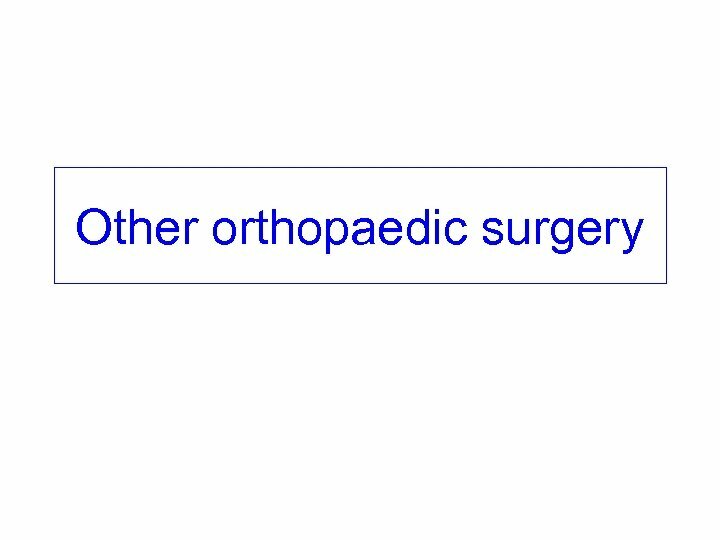 It ultimately remains their choice.